910 West Franklin Street Constructed in 1896 for James Waters Allison of the firm of Allison and Addison, a farmers' supply store at Cary Street, corner of Virginia,between 13th and 14th. Designed by New York architect T.H Randall. 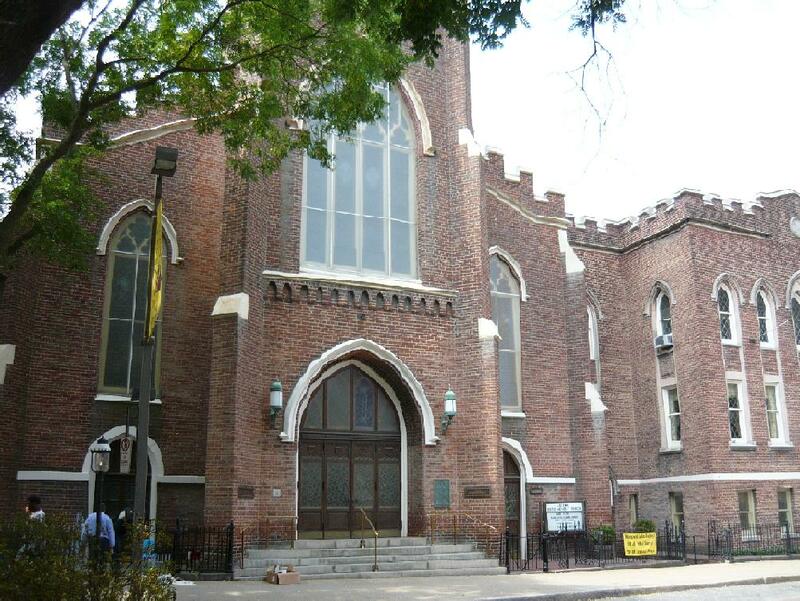 In March 1898 Allison's funeral services were conducted here and his infant son (James W.Allison,Jr) inherited the property, he was buried in Hollywood Cemetery. 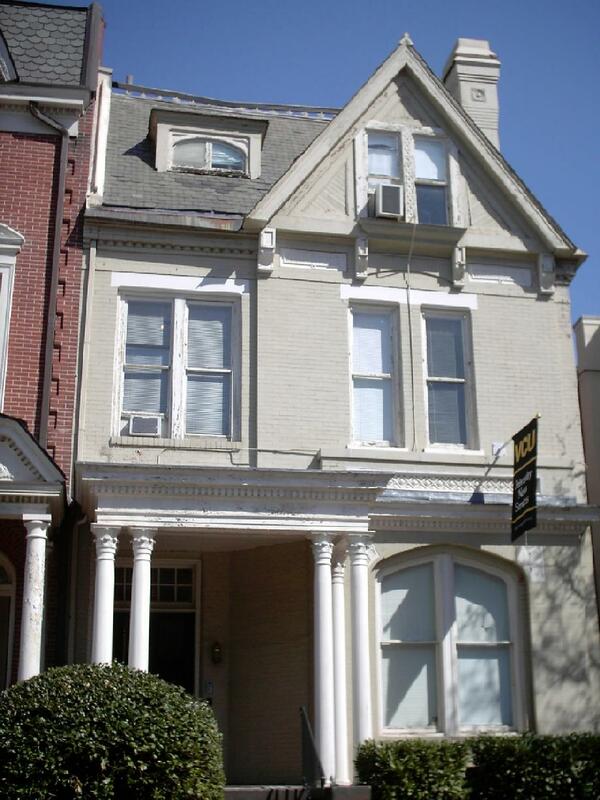 Today it houses the offices of the president of VCU. Completed in 1861 as a place of refuge for the city's poor. 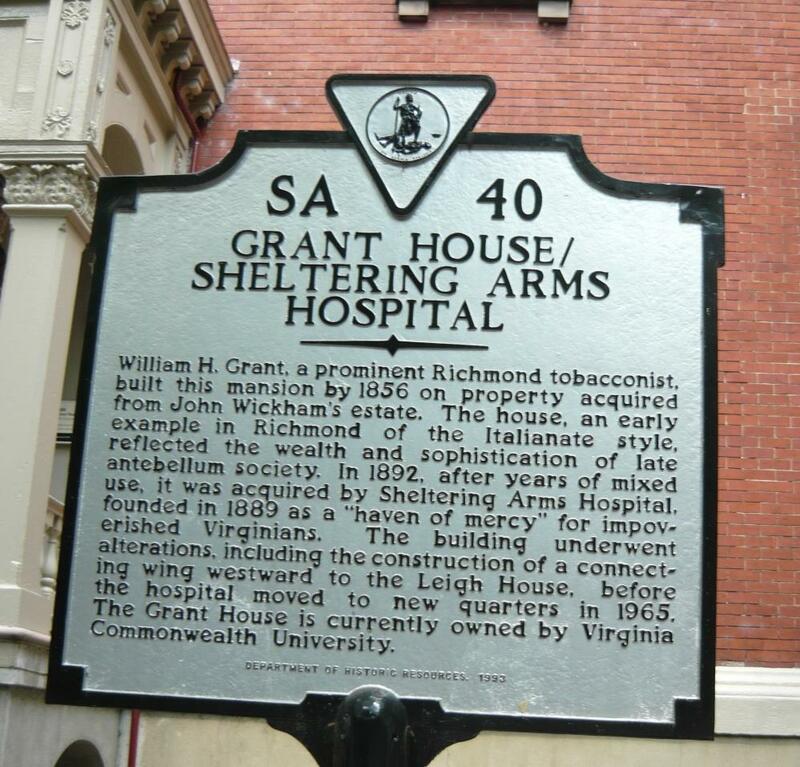 Designed by Washington Gill, it served as the first major hospital of the Confederacy. 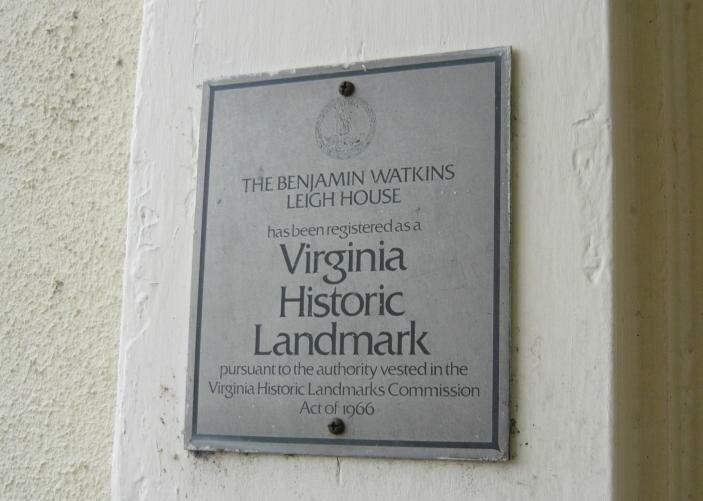 It is on the Virginia Landmarks Register. Photographed 6 Dec 2007 and Contributed by George Seitz. 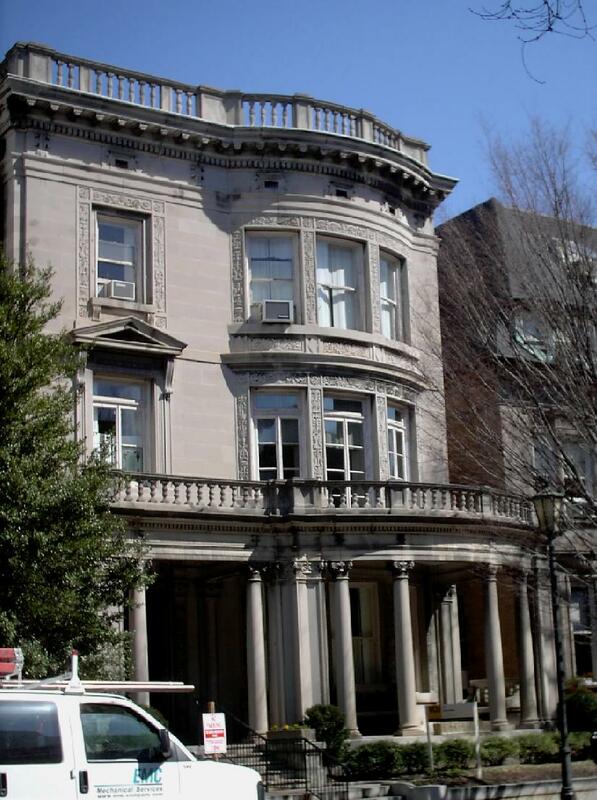 Completed in 1894, it was designed by young Richmond architect Benjamin West Poindexter who was in partnership with Charles K. Bryant at the time, 920 West Franklin Street was built as a three-bay-wide, two-and-one -half-story house on a side-hall plan. Mary Pegram Anderson was the second wife and widow of Joseph R. Anderson of Tredegar Iron Works. Mrs. Anderson had been known and well respected as Miss Pegram prior to her marriage in the early 1880s. Built in 1887 home of Douglas Baird House, in the iron works. 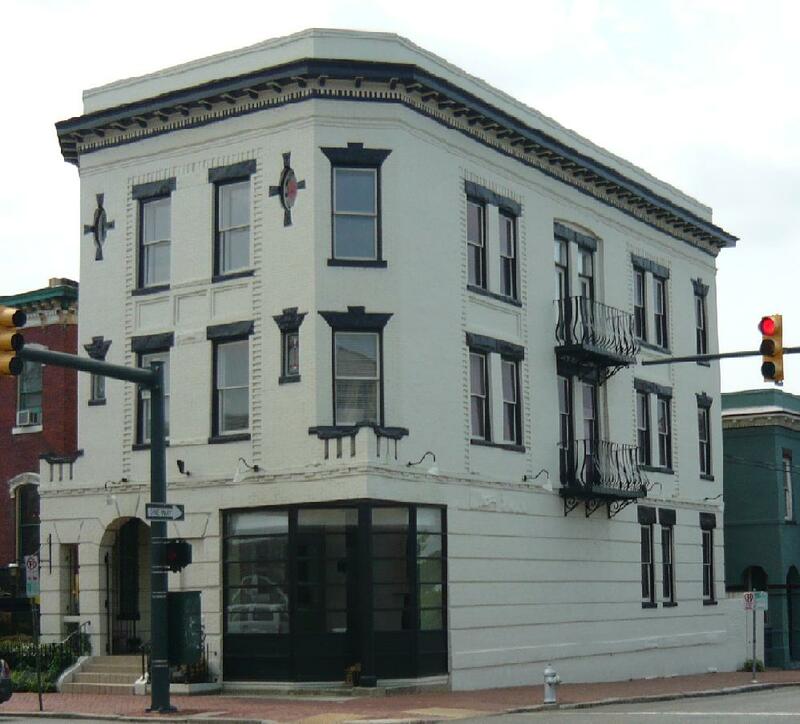 Salerooms and Office at 1557 East Main Street, David J. Baldwin (1836-1903) and George W. Brown; co-partnership formed 1883, continuance of the business established by Baldwin Brothers in 1865. Wholesale and retail hardware, tin plate, corrugated iron, carriage and wagon materials, paints, oils and varnishes. 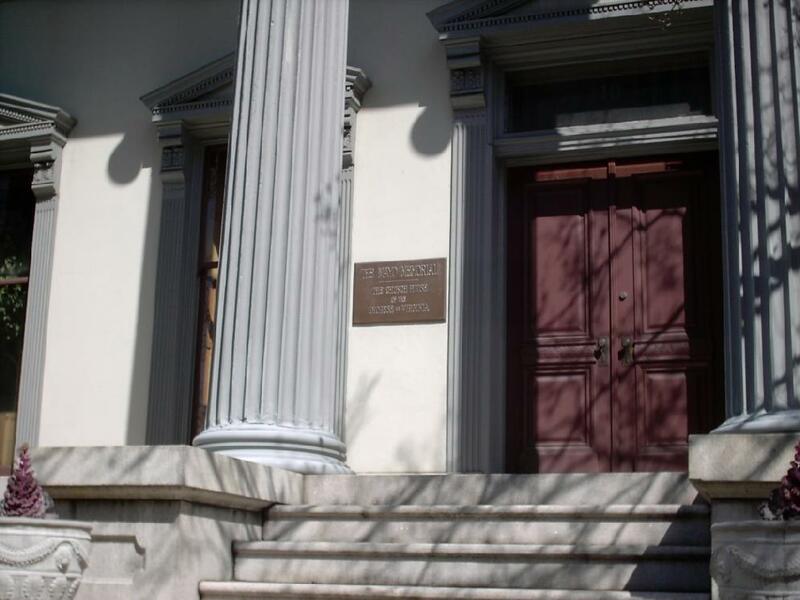 Built in 1844, the Greek Revival mansion is perhaps the finest and best-preserved survivor of it's type in the city. William Barret was a tobacconist and was regarded as Richmond's richest citizen in 1870. It is a Registered Virginia Landmark. 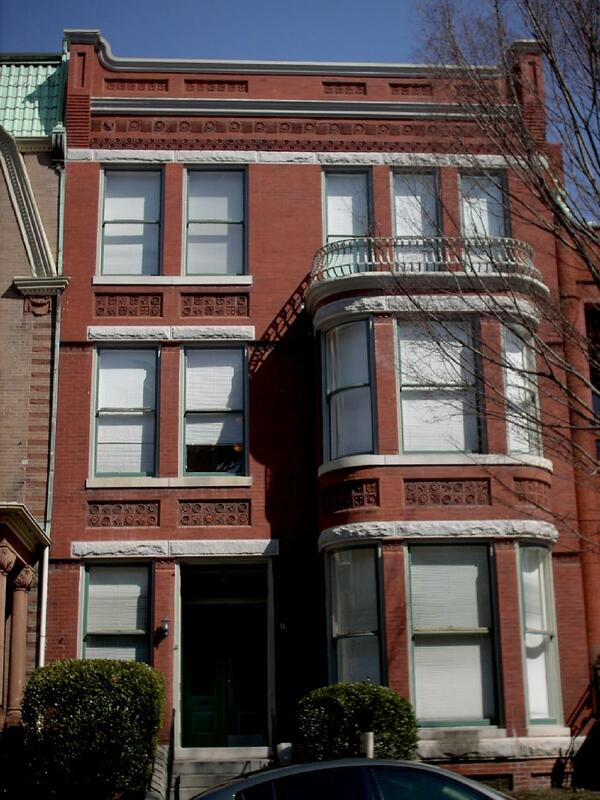 Built 1910 by architects Noland and Baskervill, RVA, at 923 West Franklin Street, at the corner of Franklin and Harrison. 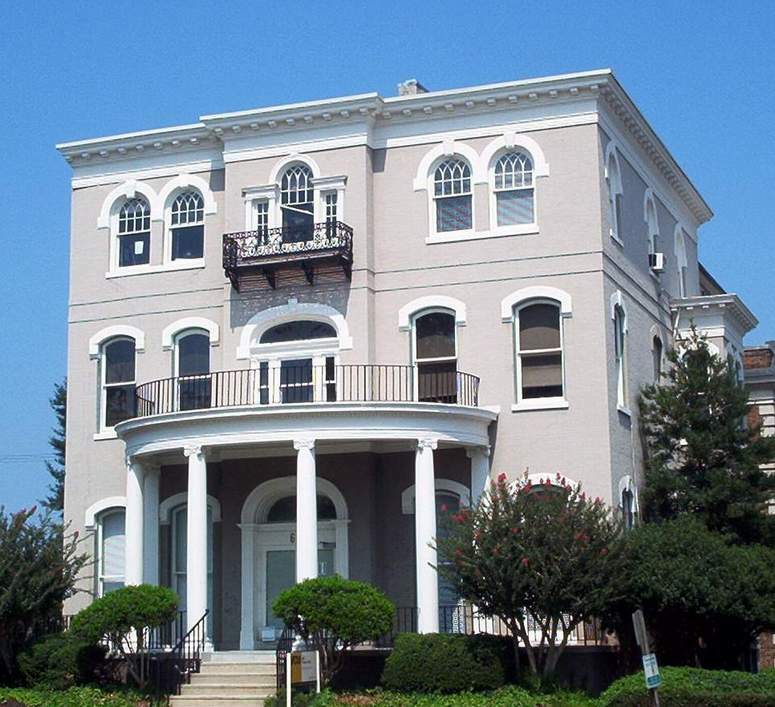 The Berkeley Apartments was the fourth apartment house on West Franklin, following the much larger Chesterfield, Raleigh and Gresham Court Apartments. The original owner was Caroline C. Wise. One of the earlier extant houses on West Franklin Street. Built for Sylvanus Blanchard 1881-1883, a wholesale grocer, the house is in the Second Empire style. 826, 828 West Franklin Street. 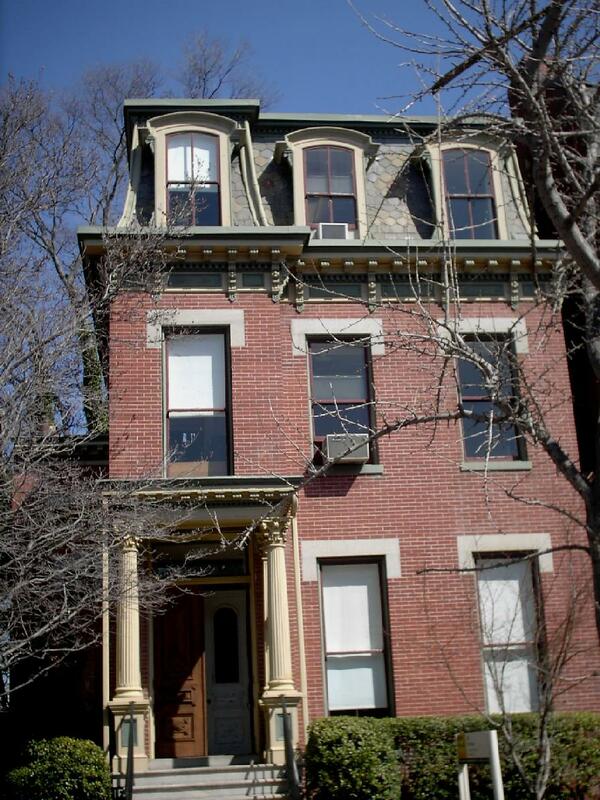 Leon L.Strause, a prosperous leaf tobacco dealer, bought this lot in February 1889 and built the house in 1892. 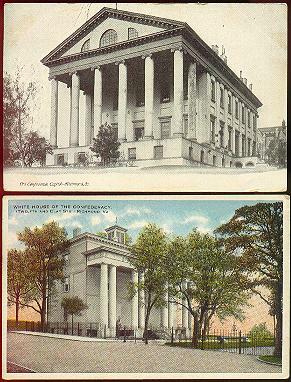 The architect was Charles Henry Read, Jr, a Richmond native who returned to the city in 1889 after working in the office of the supervising architect of the United States in Washington, D.C. Later the building served as the home and office of the noted author, historian and physician Dr.Wyndham Bolling Blanton, died in January 1960 and buried in Hollywood Cemetery. Today it's part of Virginia Commonwealth University. 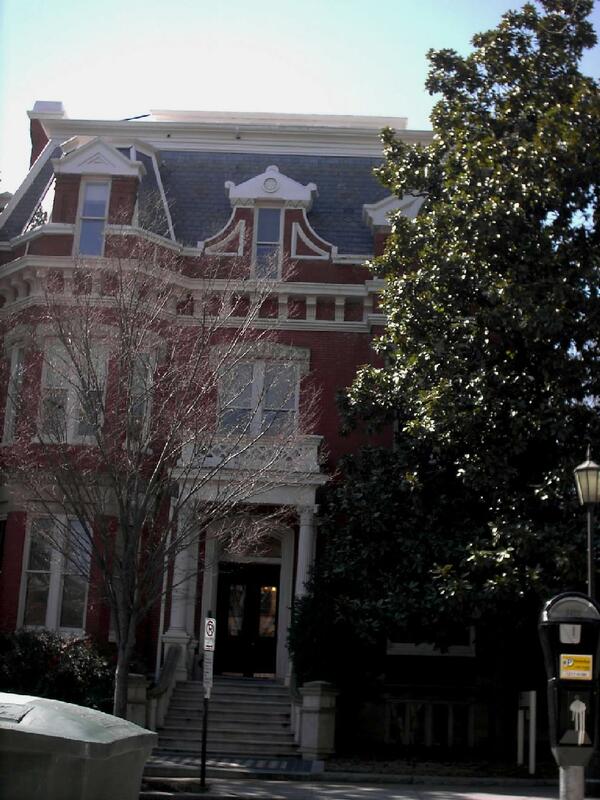 Built in 1887-88, in Italianate style, the house was built for Nathaniel Woodson Bowe, who started his career as a bookkeeper for Grubbs & Williams, Real Estate Agents & Auctioneers. He then became partner in Williams & Bowe, Real Estate & loans, with A.D. Williams in 1884, and later established N.W. Bowe & Sons, real estate. This classic design offsets the more flamboyant facades on the street. 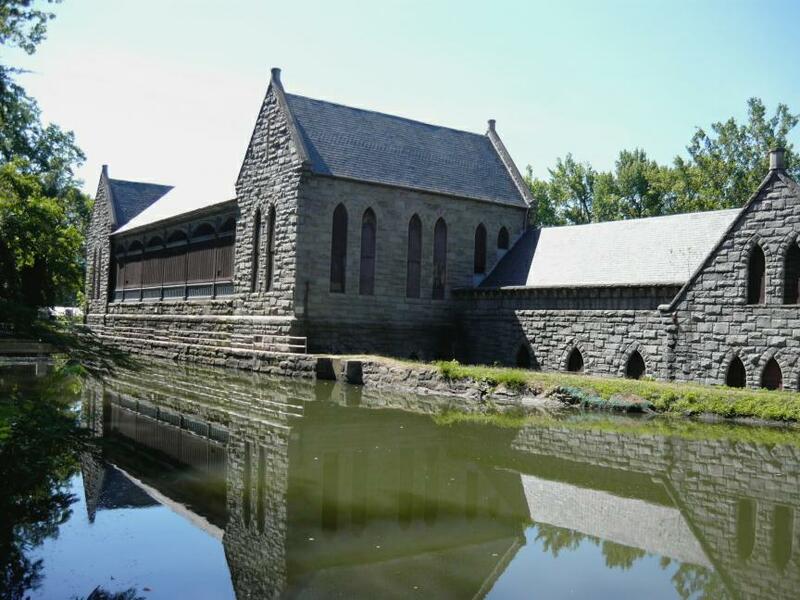 Built during the Golden Age of Railroads, it was designed by John Russell Pope in 1913. It has a Tuscan colonnade and a Roman dome. It was completed in 1919. 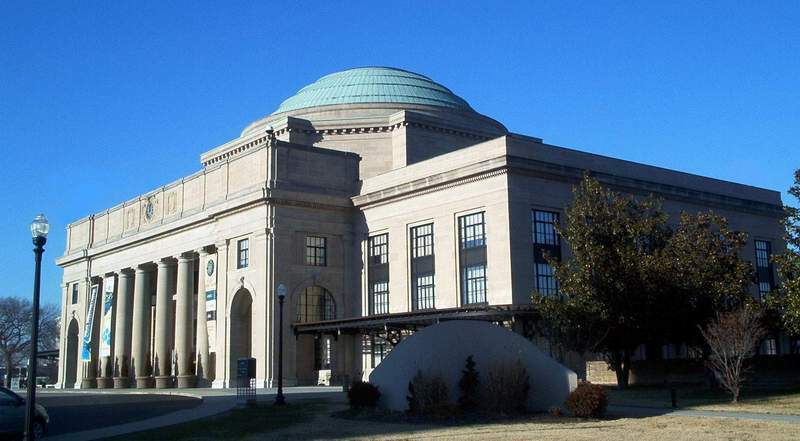 It now operates as The Science Museum of Virginia. It is a Registered Landmark. Architect: Peter J. Lauritsen, NYC. 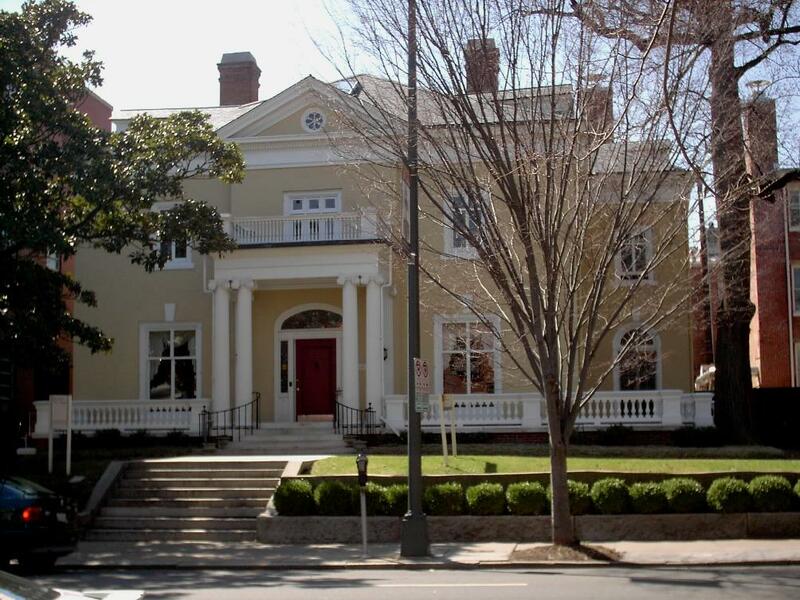 The house was commissioned by Sue Williams Buek and Charles E. Buek, daughter and son-in-law of tobacco magnate T.C. Williams, Sr. According to Buek's daughter, the house was built on family property, at the edge of the garden of the T.C. Williams, Sr. House. Buek was listed in directories as secretary of Curtis & Buek, foreign ship brokers, and manager of Richmond Elevator Company. 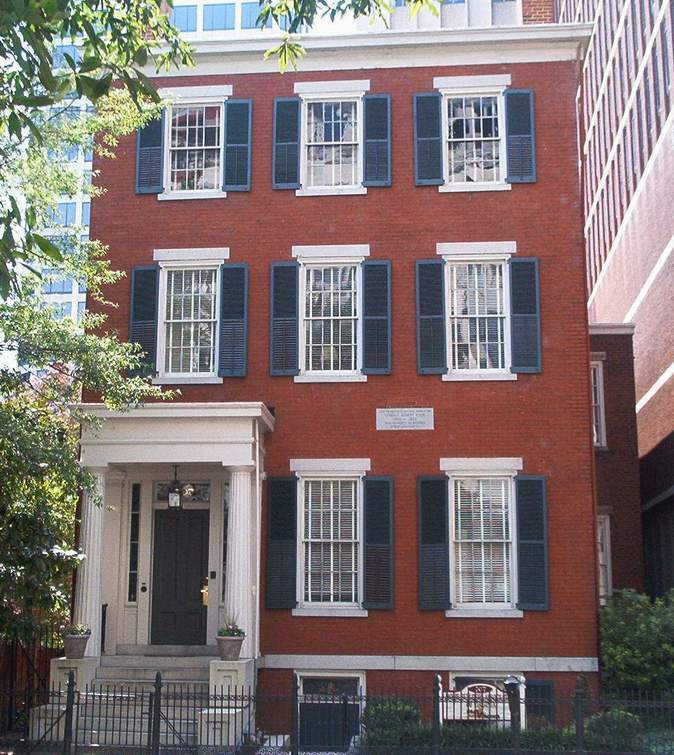 401 West Franklin St. Owners, Peyton Drew and finished in 1814 by John Mutter - prominent citizen of the city. Sold in 1830 to David Bullock mayor of Richmond. 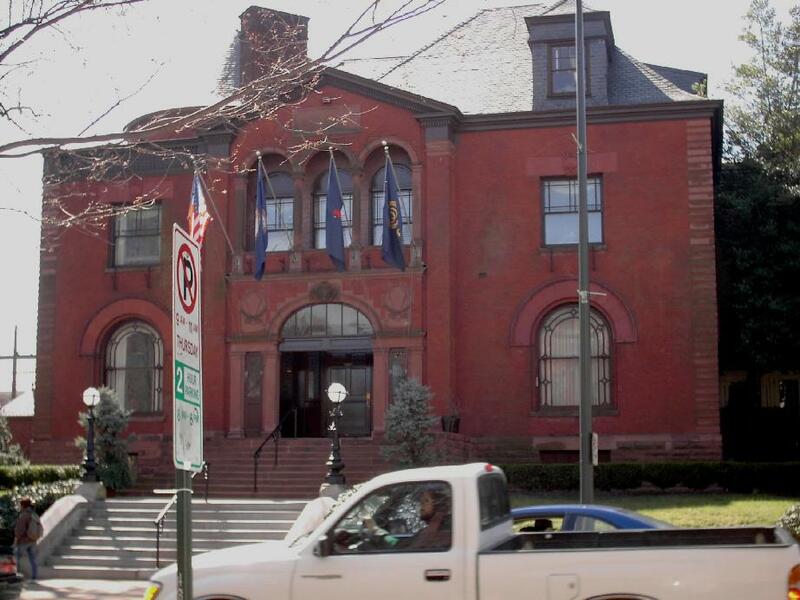 The Commonwealth Club was organized March 3, 1890 and succeeded the old Richmond Club and opened here on January 15, 1891. 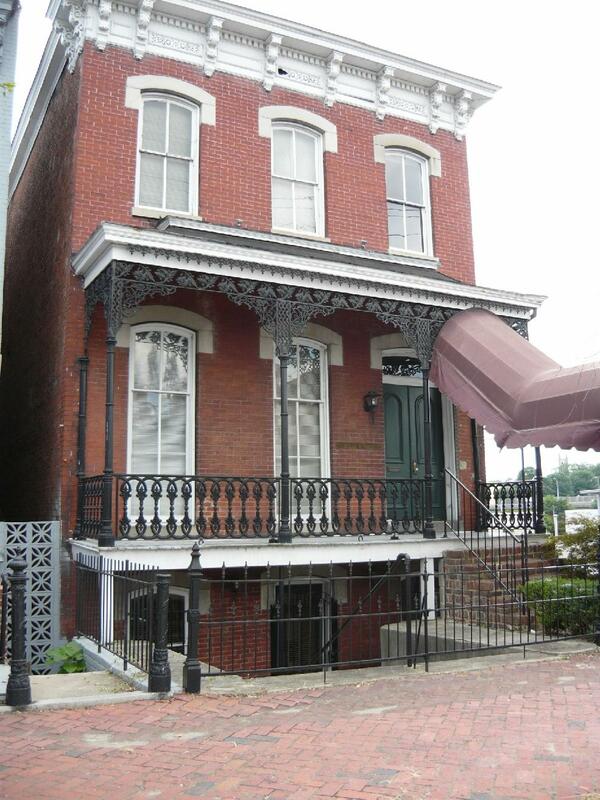 Built in 1847, it is the sole survivor of the fashionable neighborhood that was once on Gamble's Hill. 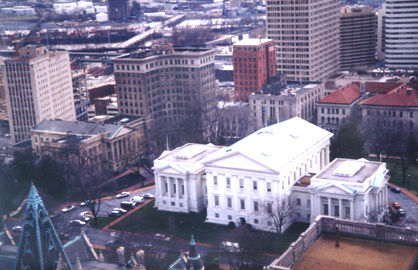 The house has served as the headquarters of the Virginia Education Association since 1951. 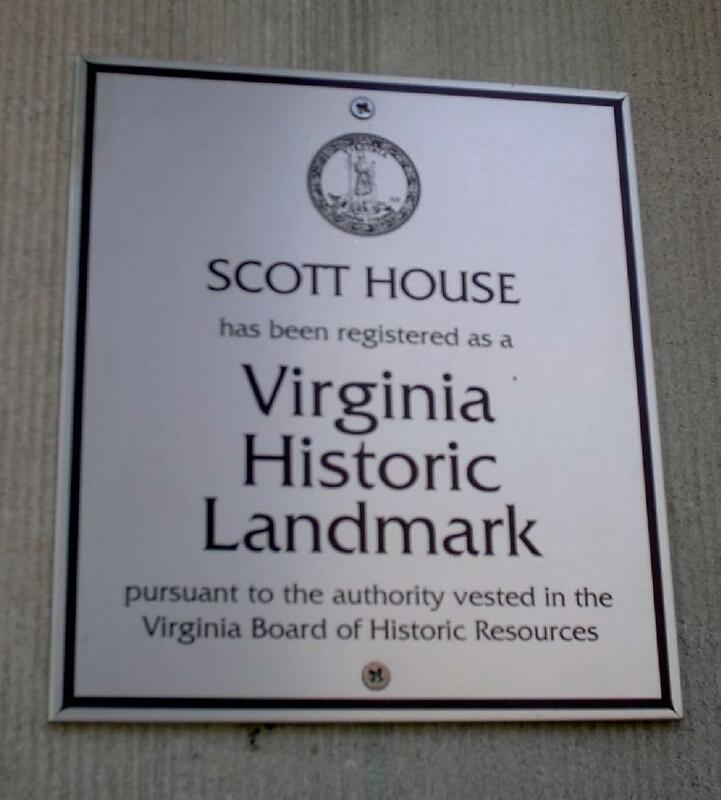 It is a Registered Virginia Landmark. Photographed 4 Jan 2008 and Contributed by George Seitz. Found at the bottom of the excavation for the One James Plaza in Richmond. 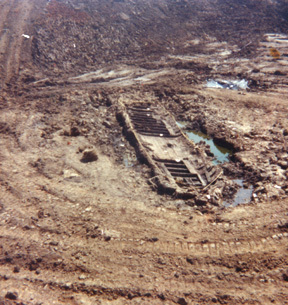 Located on what was the turning basin for the packet boats in the canal. Evidently they just scuttled the boats they weren't using any more. 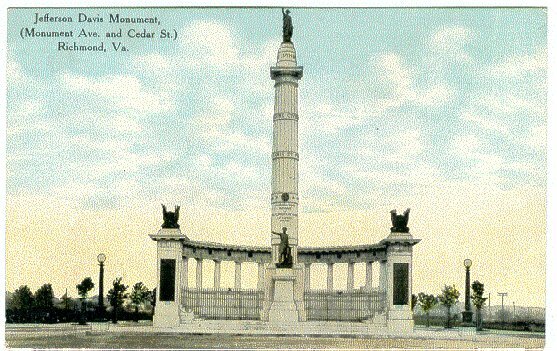 Erected as memorial to the Virginians that fell in World War I. 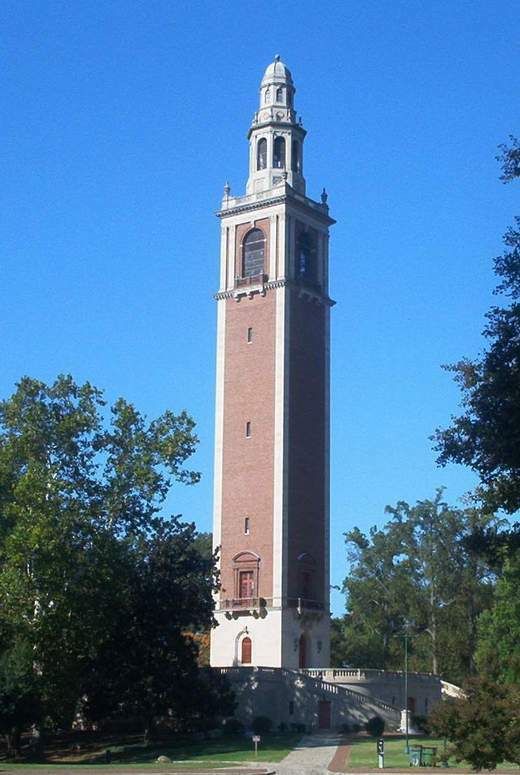 It rises to 240 feet and contains 66 bells on which concerts are given. Photographed 8 Oct 2007 and Contributed by George Seitz. Built in the late 19th c.
Building ca,1853 Original owner Charles Howell 1880-1895,Merrills School for Girls. At 1007 East Clay Street. 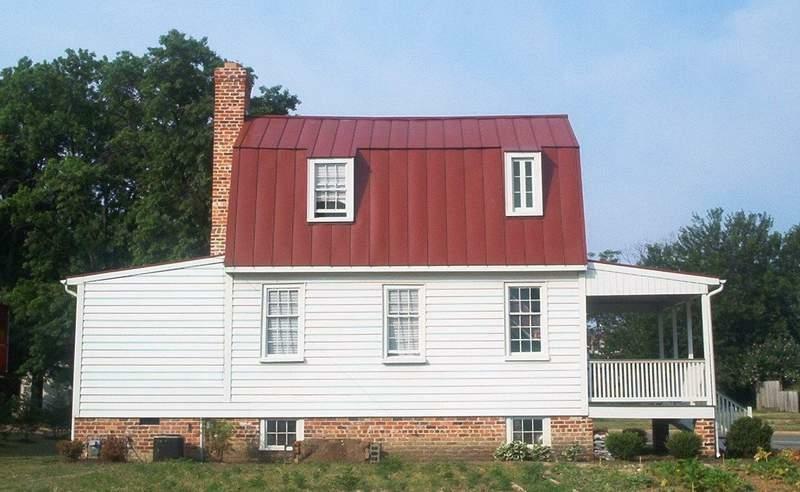 Built in 1840,Original owner: Frederick R.Bransford. Bransford House. 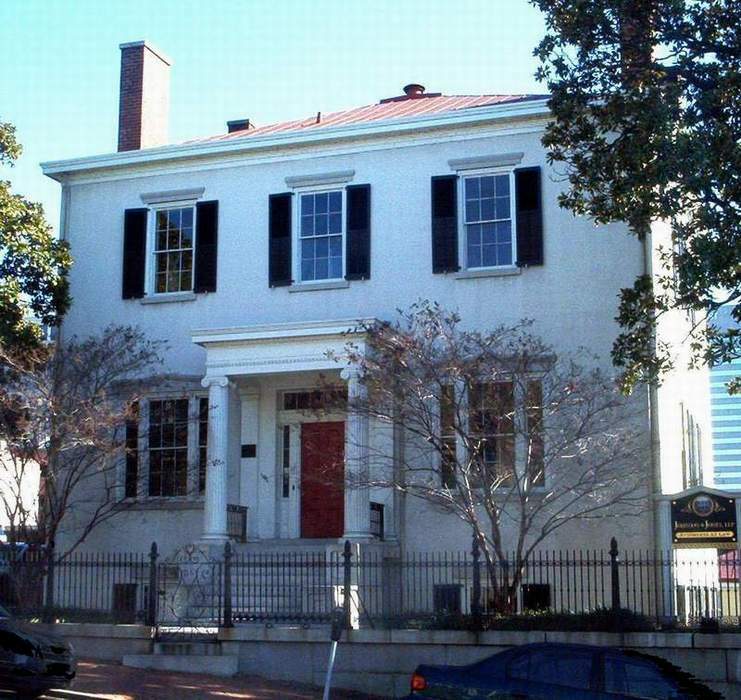 This house was originally located at 13 N. 5th St. After serving as church house (Cecil Memorial), of the Second Presbyterian Church, it was dismantled and rebuilt on its present site. It now serves as an annex of the Valentine Museum. 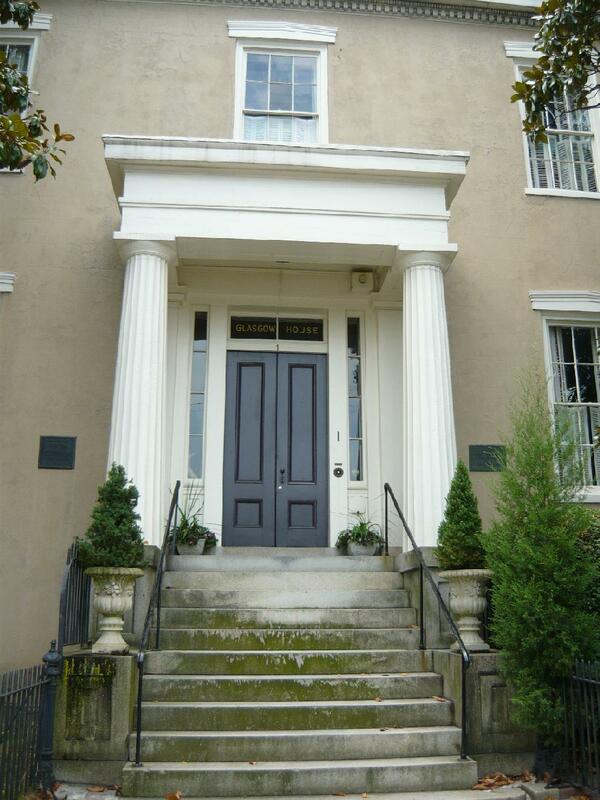 "Typical Greek Revival Mansion", handsome Greek portico entrance on stone base and steps. Bransford died in April 1858. 409 East Grace Street, near Fifth Street. Historic Building, dedicated in June 1843, built in 1841-1845,architect John and Samuel Freeman. Tower and facade alterations in 1874, designs by by Albert L West. 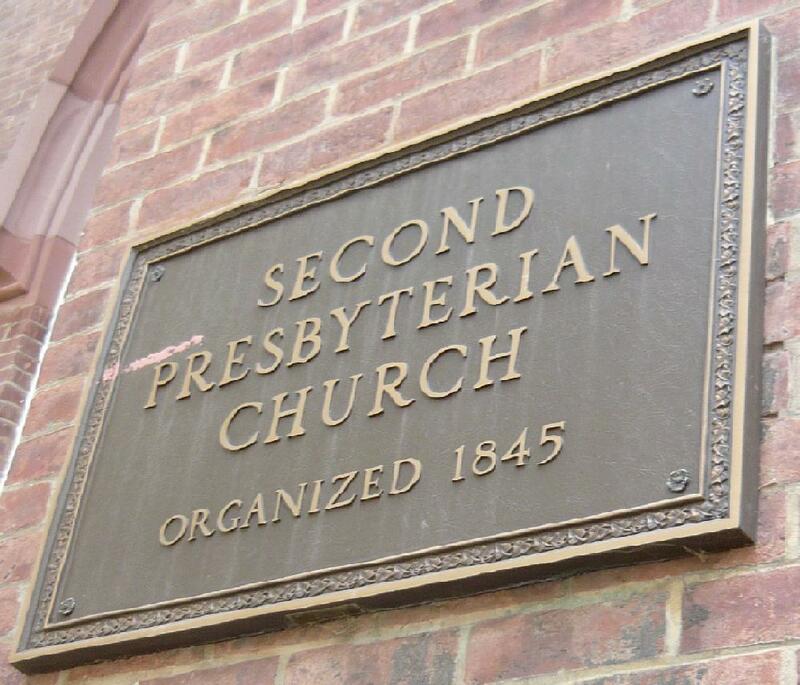 Successor to Shockoe Church, first pastor Rev. M.D. Waller. 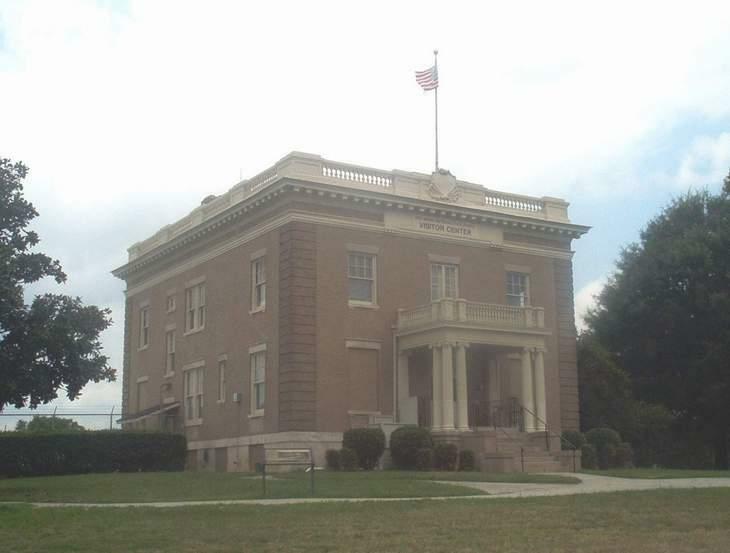 Built in 1909 as a federal weather station, it is on the site of one of the largest and best known Civil War military hospitals. Photographed Jul 18, 2009 and Contributed by George Seitz. View from the area of Hollywood Cemetery. 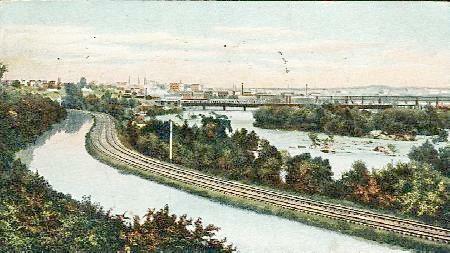 Looking downstream towards the business district. From an old postcard about 1900. Taken by Elizabeth in 1992. 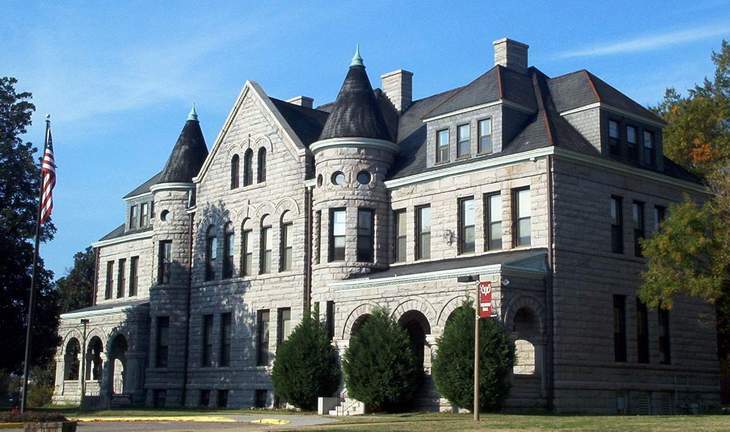 The Gothic building is the old City Hall built in the 1880s or 90s. 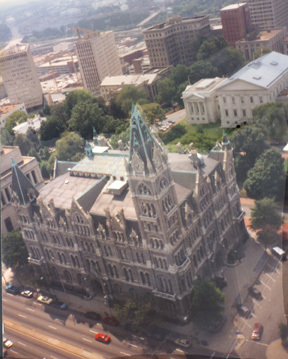 The picture was taken from the Observation deck of the new city hall. On the campus of Virginia Union University. It opened in 1899. Burned in 1970, it was restored. It is named after former Maine Governor Abner Coburn. 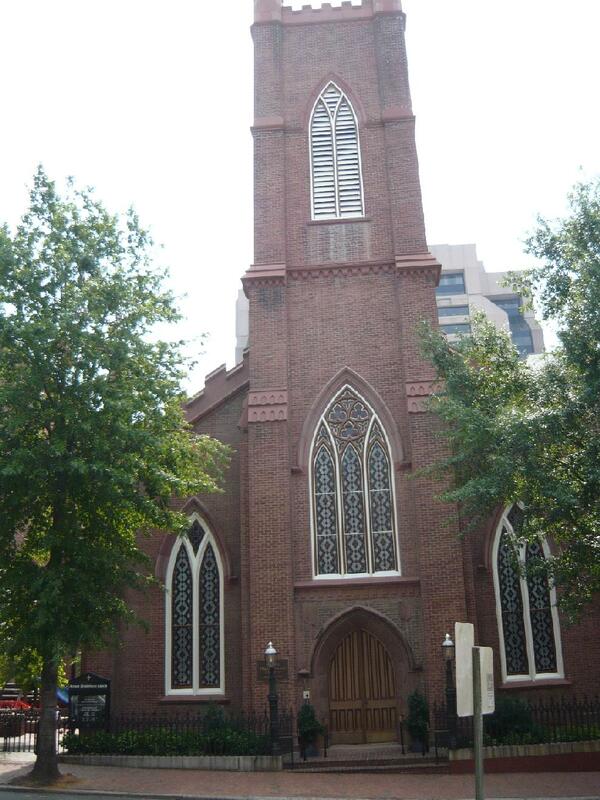 Dr. Martin Luther King Jr. once preached here. Photographed 14 Nov 2007 and Contributed by George Seitz. 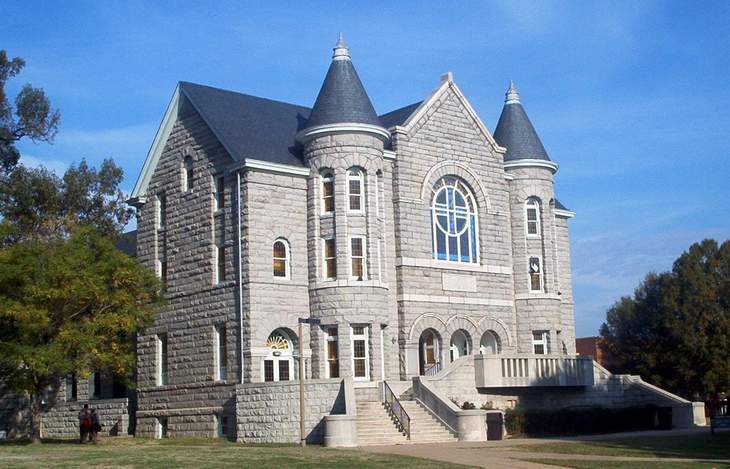 Erected in 1887 as a place of worship for the veterans that lived in the Robert E. Lee Camp Confederate Soldiers' Home. 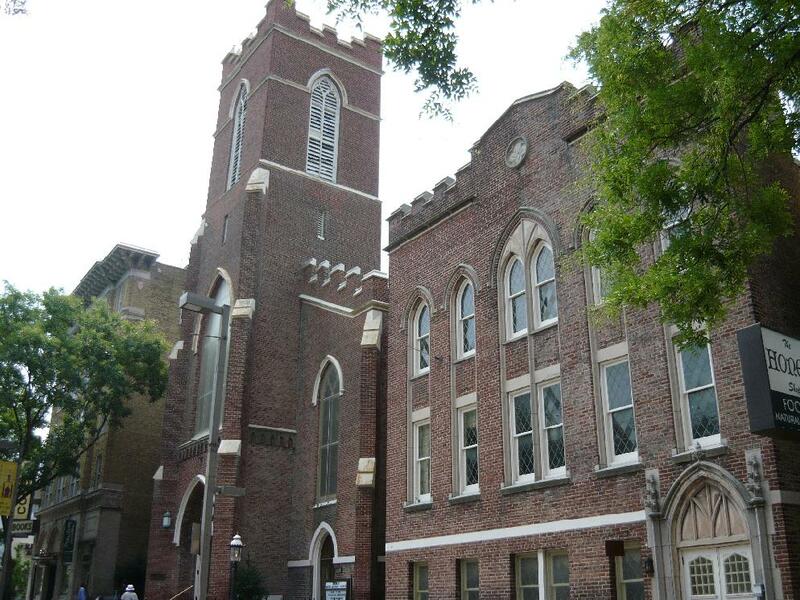 Marion J. Dimmock Sr. designed the Gothic Revival Structure. It was used regularly until the last resident veteran died in 1941. It was restored in 1961. Photographed 5 Nov 2007 and Contributed by George Seitz. In Hollywood Cemetery. 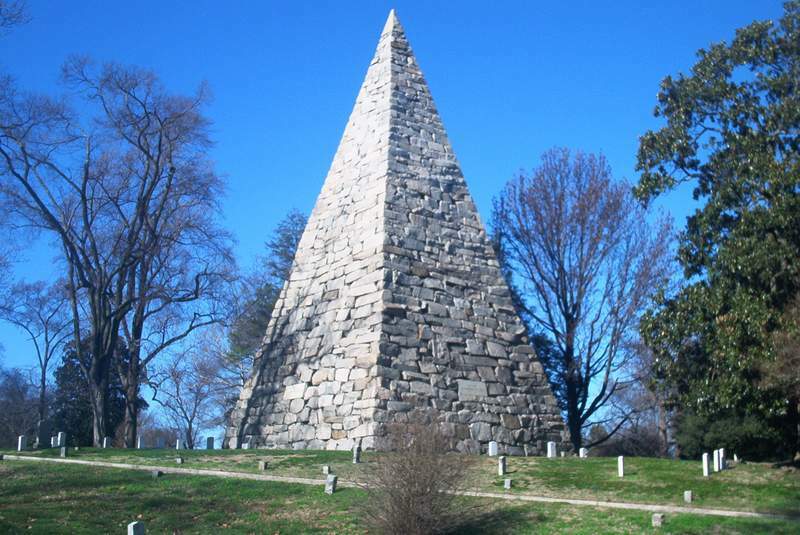 Charles Dimmock designed the pyramid-shaped monument built of granite from the James River. 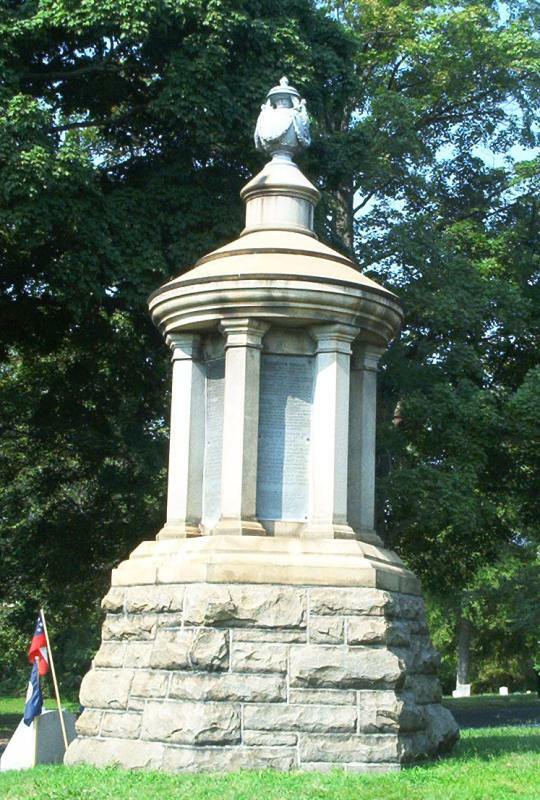 A volunteer named Thomas Stanley, who was serving a sentence at the State Penitentiary, placed the capstone on November 6, 1868. 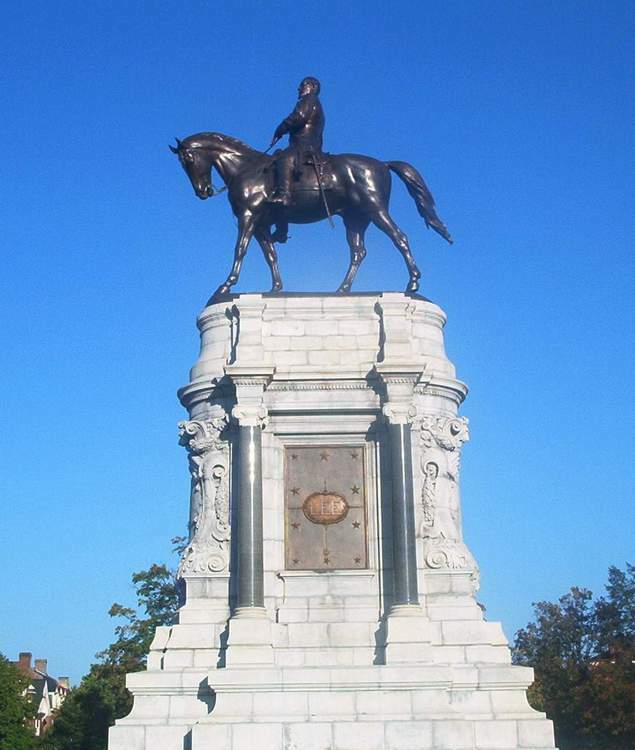 It is inscribed, To the Confederate Dead - Memoria in Aeterna Numini et Patriae Asto, meaning "In eternal memory of those who stood for God and country." 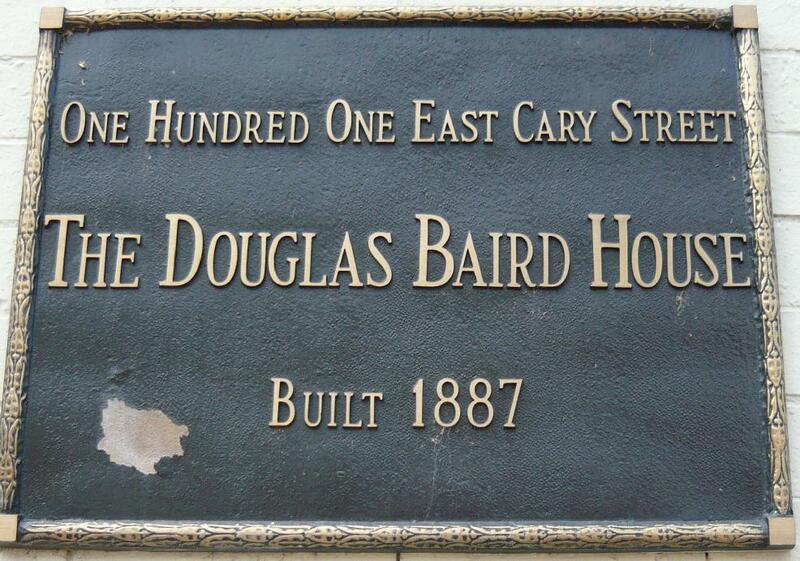 At 100 East Main Street, built in 1814-1815, for Curtis Carter. 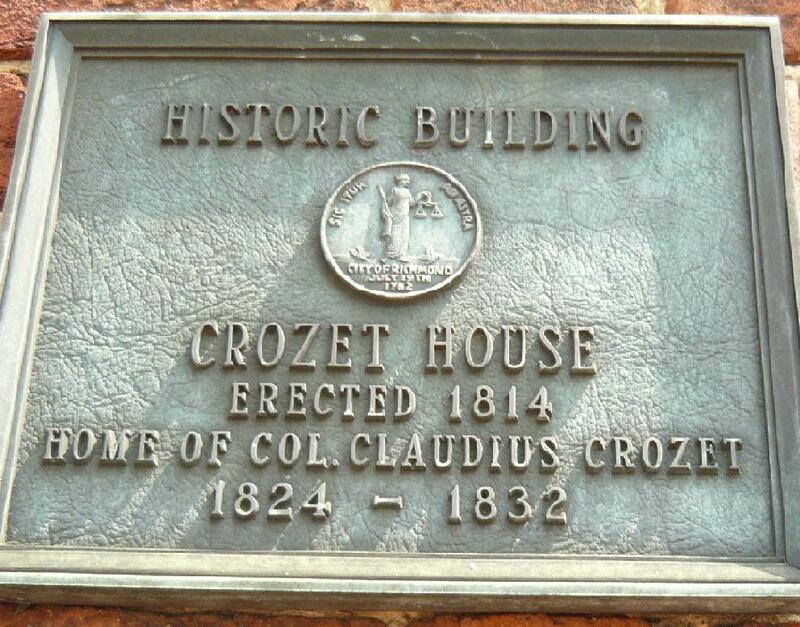 Home of Col Claudius Crozet from 1824-1832, a noted French engineer who served the state of Virginia. Died in 1864, originally buried at Shockoe Cemetery but reinterred and buried at the Virginia Military Institute. In Hollywood Cemetery. Davis is best known for being the President of the Confederate States of America, He was also US Senator and Secy of War. at Davis Ave. This work by Edward V. Valentine was unveiled in 1907. George G Ryan, architect and builder, worked extensively in the early 1890's. 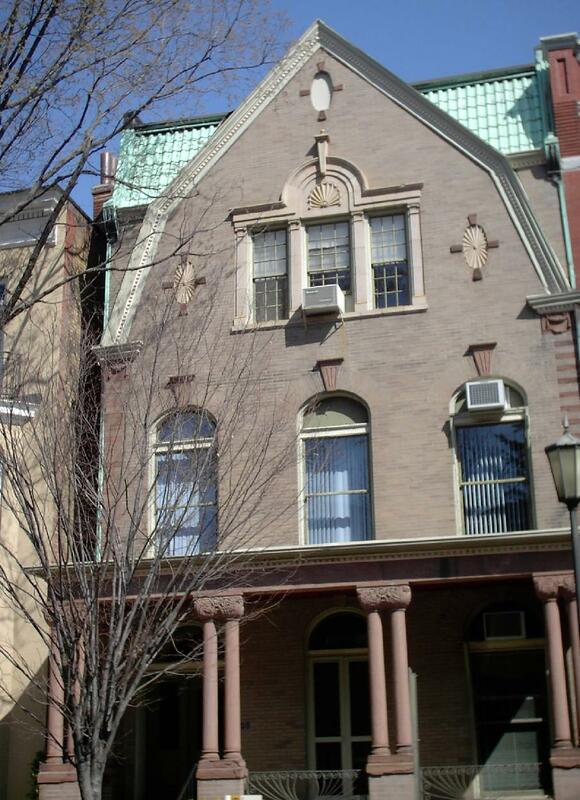 Teamed with investors John Mahony, a Richmond dentist and Daniel H Mahony, a Philadelphia publisher, the three had a hand in erection of more than forty speculative houses, most of them on Floyd Avenue. The congregation began as a regular assembly of slaves in their quarters. In 1865 they built their own church. 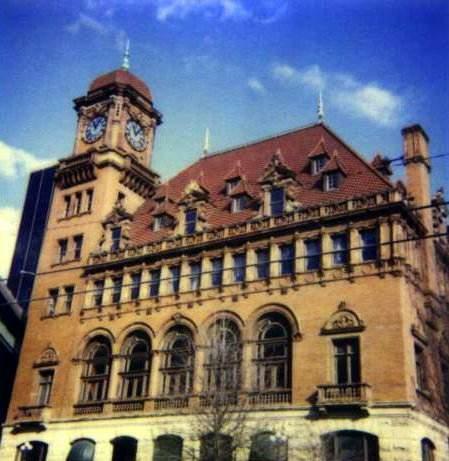 The present building was finished in 1884. It is a Registered Virginia Landmark. 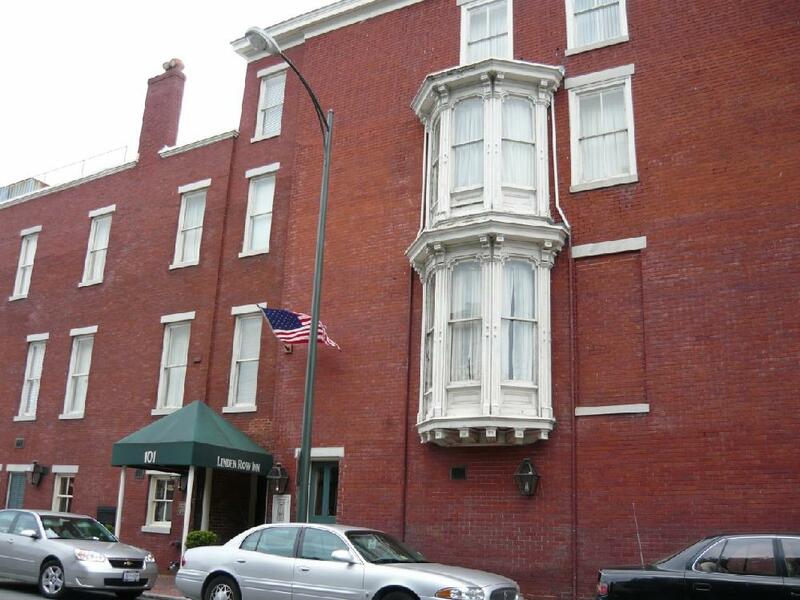 In the Historic District, in the 100 block of West Franklin Street, across from the Jefferson Hotel. Built in the mid 1800's, vacant for a number of years. Part of a historic district. 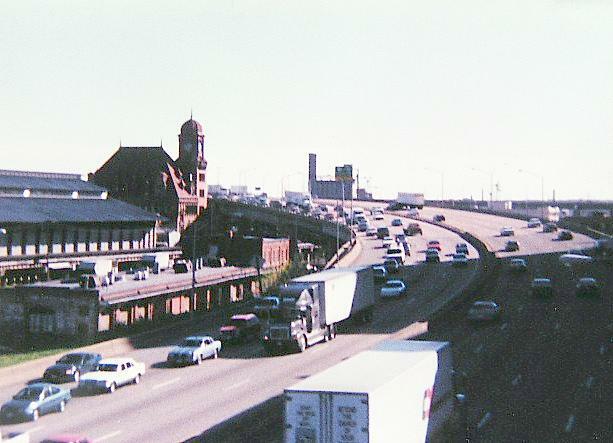 Photographed Sep 3, 20007 and Contributed by George Seitz. 912 & 914 W. Franklin St.
One of Richmond architect Albert L. West's last commissions before his death in 1892 was this pair of townhouses for two prominent businessmen, Thomas E. Stagg, manufacturer of sashes, blinds and interior finishes, and George B. McAdams, of McAdams & Berry, clothiers. Stone and brick work was carried out by local contractor W.O. Burton. Thomas E. Stagg started out in Richmond as a carpenter, eventually owning his own business, including a planing mill and box factory. 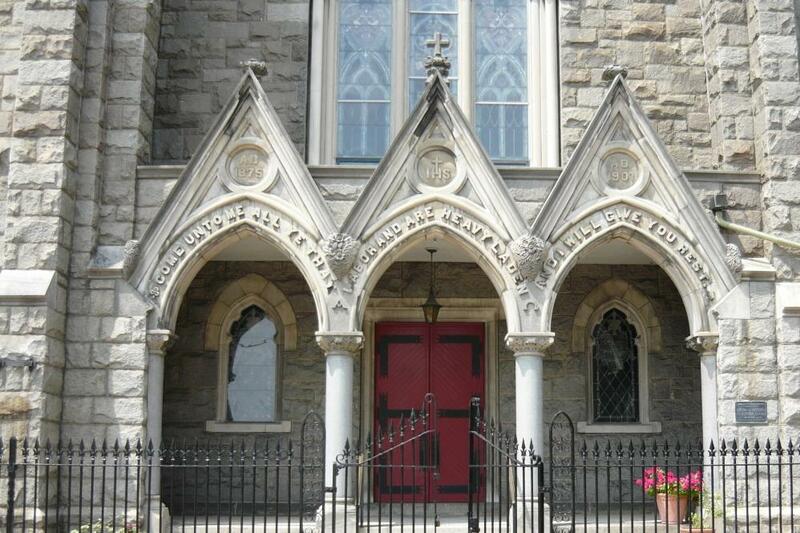 designed by German architect Carl Ruehrmund for William G. Stokes . Ruehrmund received his training at the Royal Academy of Architecture in Berlin, and emigrated the States in 1881. 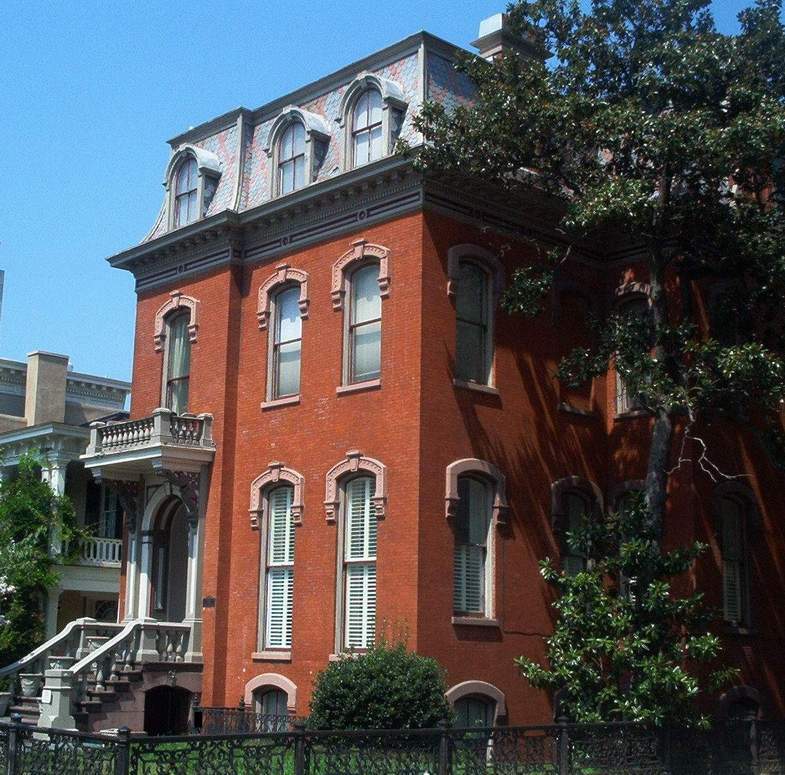 The three-story Stokes House was built on a side-hall plan. Stokes made his money in the wholesale grocery and commission merchant business,began his career working for his father's company, A.Y. Stokes & Company. After the death of the senior Stokes in 1886, Thomas Potts, W.G. Stokes, and brother Allen Y. Stokes, Jr., formed Potts, Stokes & Co., wholesale grocers and commission merchants. After the dissolution of Potts, Stokes, & Co., W.G. Stokes went into business manufacturing harnesses in the firm Wright & Stokes, steam tannery and collar factory. At 1 West Main Street, Greek Revival House. Original owner David M Branch built in 1841, rear wing a later addition. Home of Ellen Glasgow,known novelist. Identifying plaque on exterior wall. Home of Joseph P Winston and family in 1882. Building early 1800's. 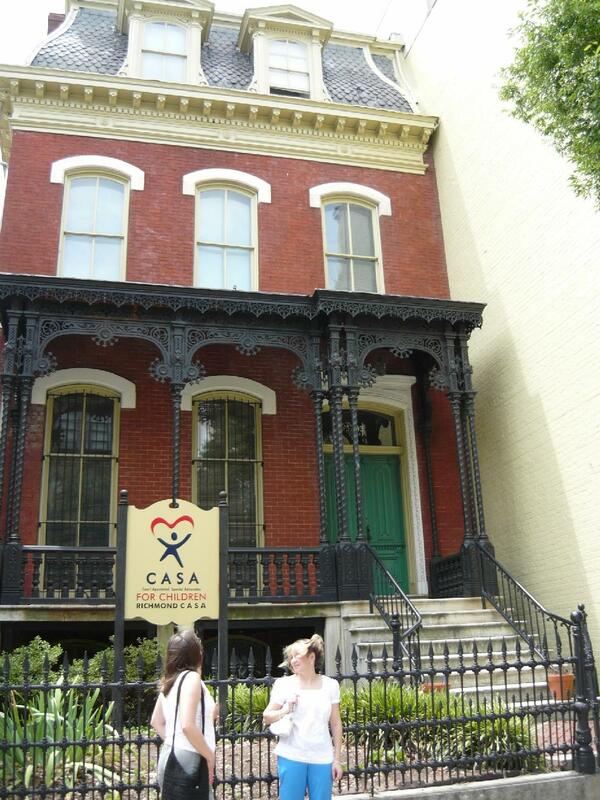 Today CASA For Children of Richmond. Perhaps the oldest existing structure in the Fan District. Built in 1842 and associated with General Phillips, who served with the Confederate militia, this cottage is believed to have served as a structure for managers of the Phillips' family's surrounding landholdings. 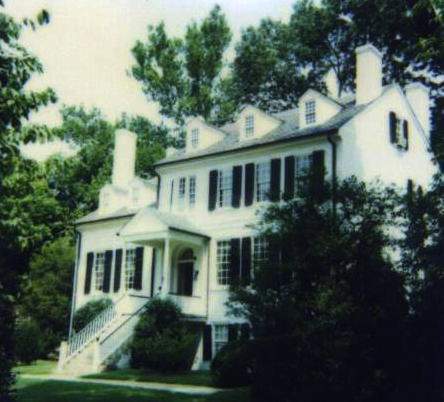 The original manor house is said to have fronted the James River nearby and was later destroyed by fire. Built in 1856. An imposing mansion which shows the architectural exuberance and romanticism of the 1850s. Grant died in 1885 and is buried at Hollywood Cemetery. 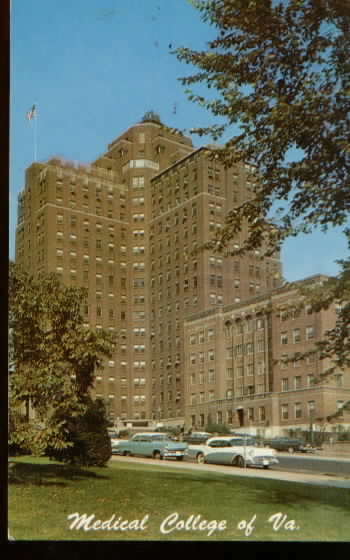 Despite conversion of the building to a hospital, the front facade is virtually unchanged. 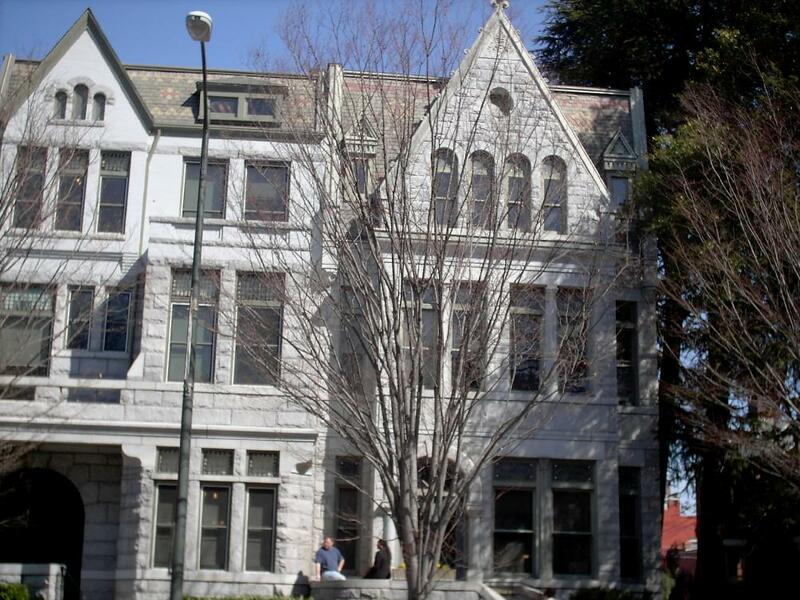 In 1892 this building became the Sheltering Arms Hospital, a charitable institution. 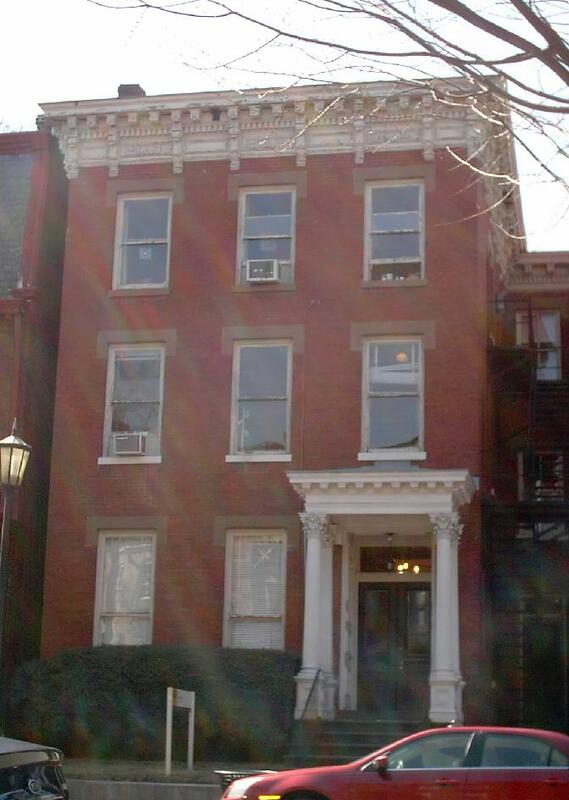 922 West Franklin Street, one of the so-called Italianate houses of the 900 block of West Franklin Street. 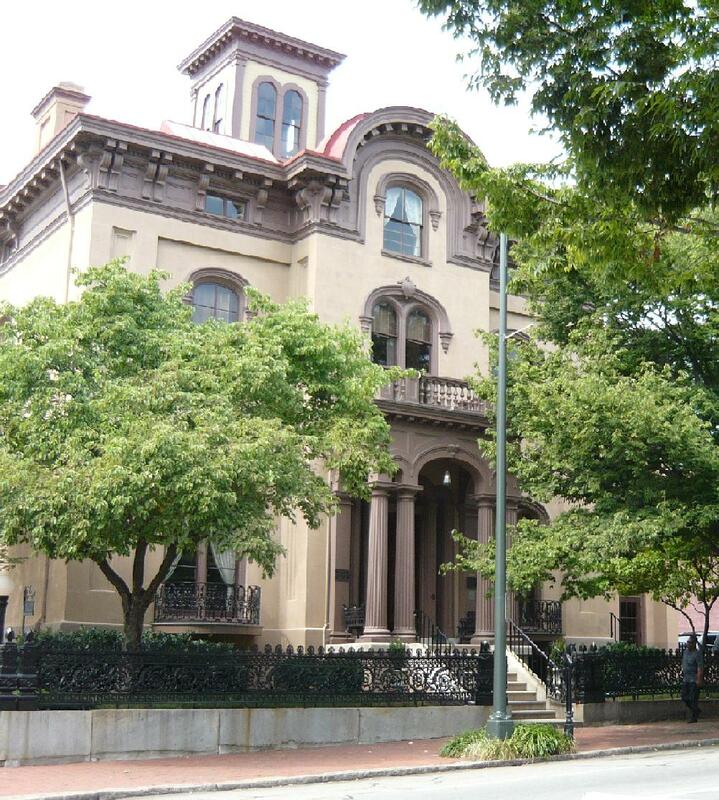 Built by architect Albert L. West, RVA, in 1888-89 for clerk Percival S. Grant, it was occupied by C.P. Stokes, of 805 West Franklin Street, as soon as 1892. On West Franklin Street, built in 1886. 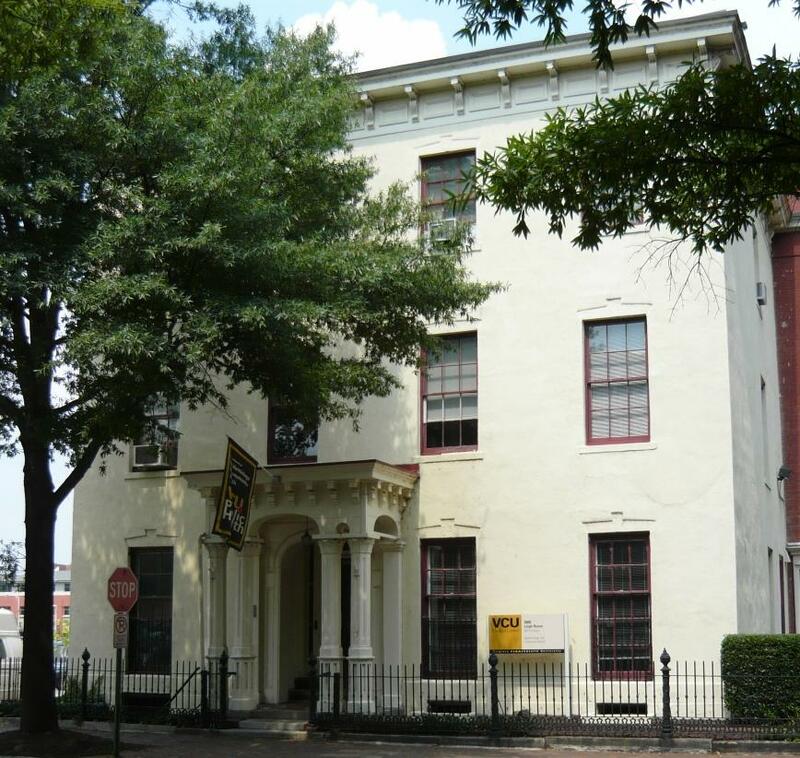 The house was built by local contractors Trexler & Elmore for Thomas H. Gunn, partner in Christian & Gunn, tobacco stemmers and commission merchants. 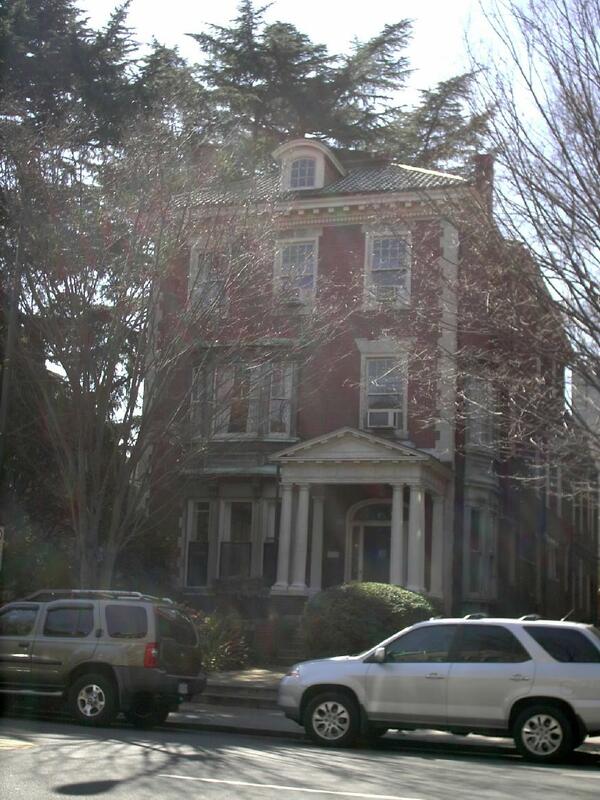 Gunn died in 1888 and his heirs sold the property in the early 1890s to T. William Pemberton. Designed by Henry Latrobe for Michael Hancock, it was completed in 1809. 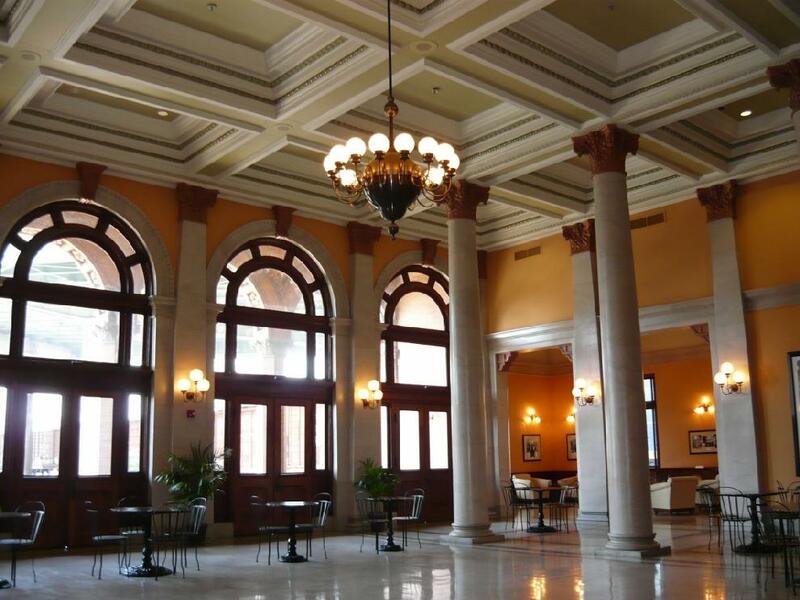 It has an arcaded gallery and marble trim. The interior woodwork is of the finest quality. 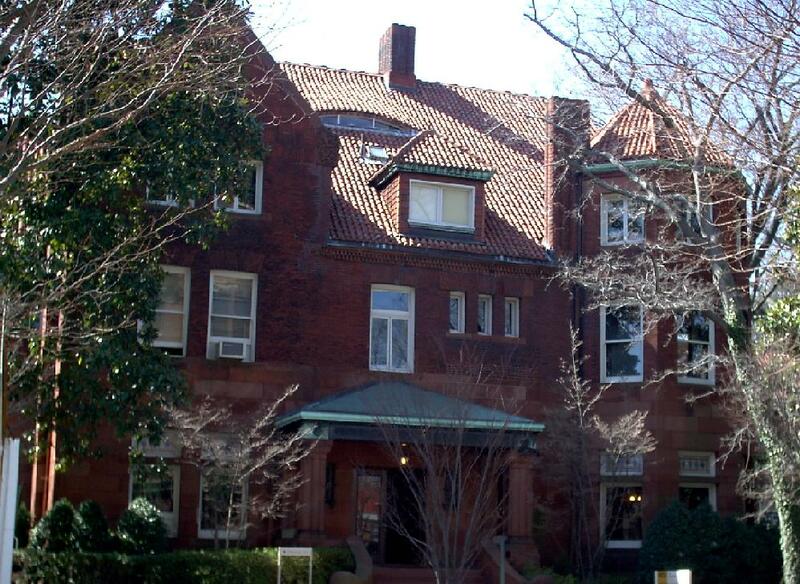 It has been the home of a U.S. attorney general and two mayors of the city. Photographed 6 Jan 2008 and Contributed by George Seitz. 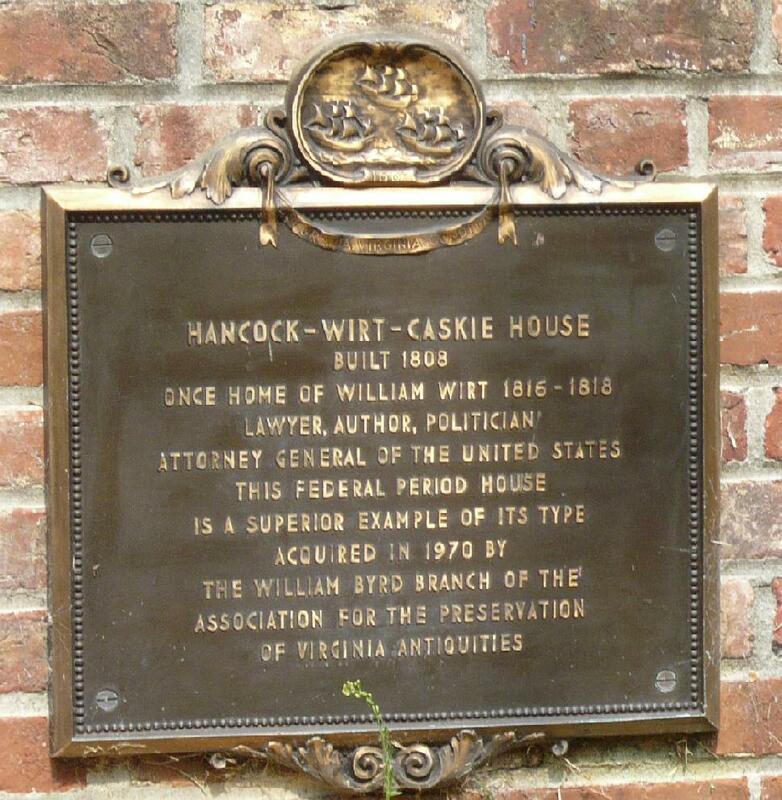 Plaque describing the house and its significance. 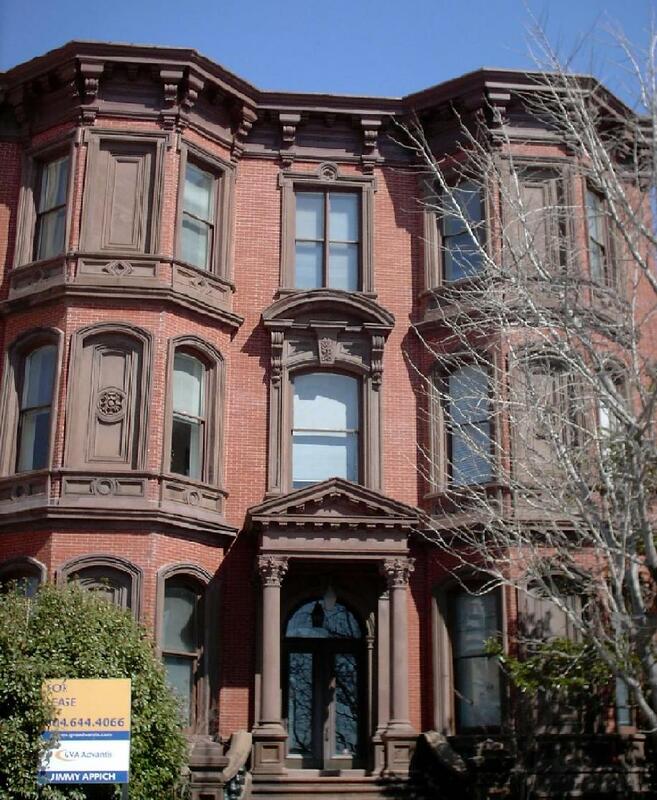 Built 1887 for John Dunlop, a lawyer and reputed poker associate of Lewis Ginter, and his wife, Mildred Maury Dunlop. 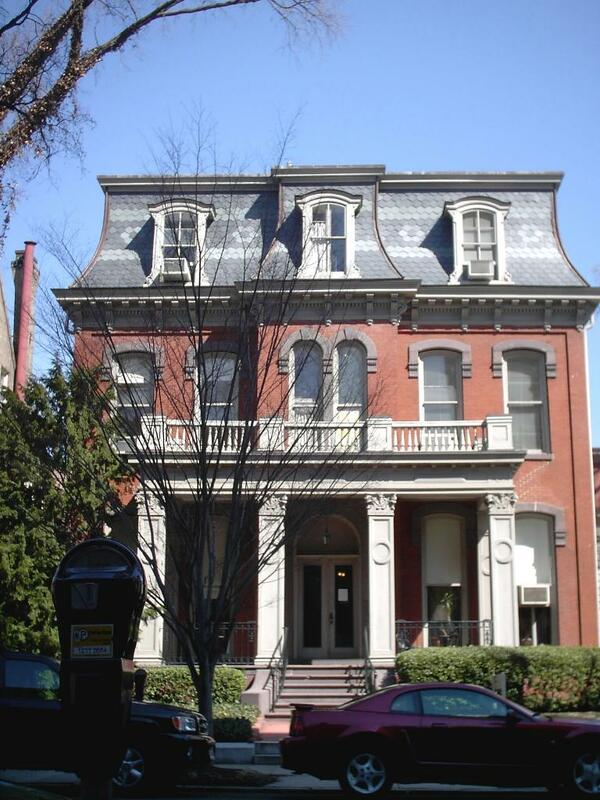 211 East Franklin Street, Historic Building built in 1859 for Bolling W.Haxall and wife, Annie E Triplett. 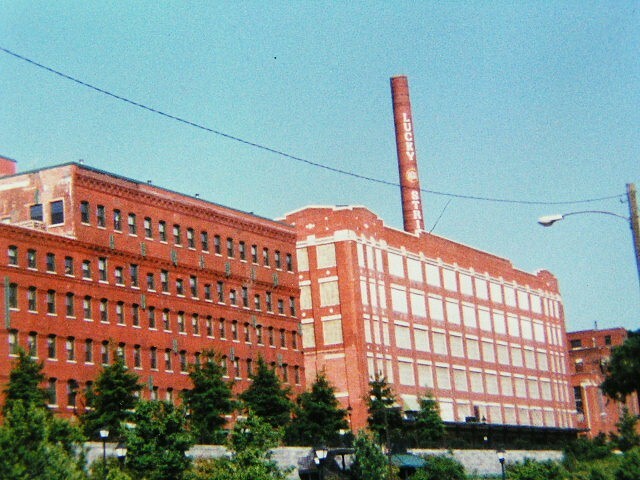 Of Haxall-Crenshaw Flour Mills. 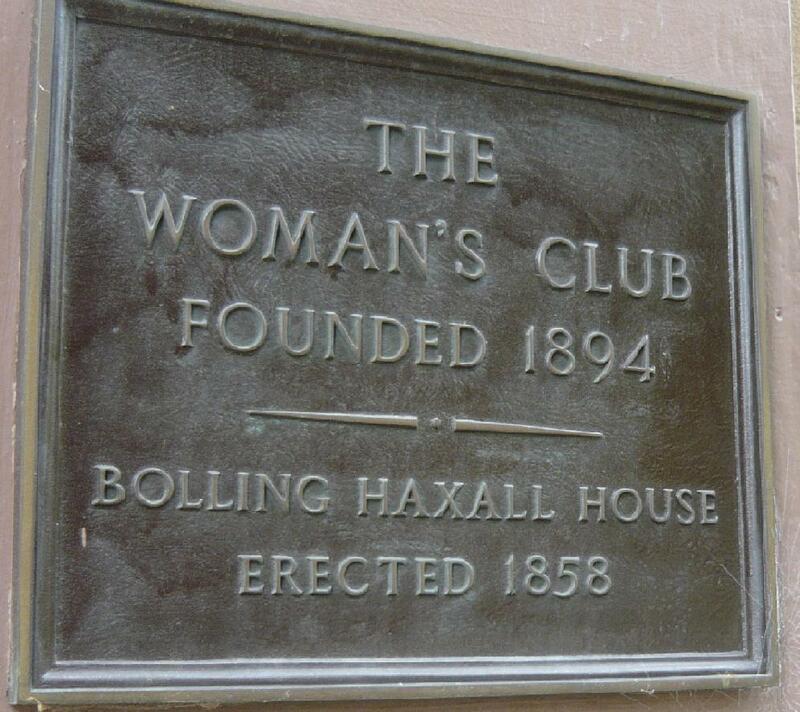 Haxall died in June 1885 and buried in Hollywood Cemetery. 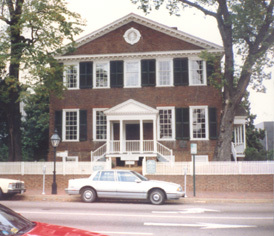 Later used as the Woman's Club of Richmond. 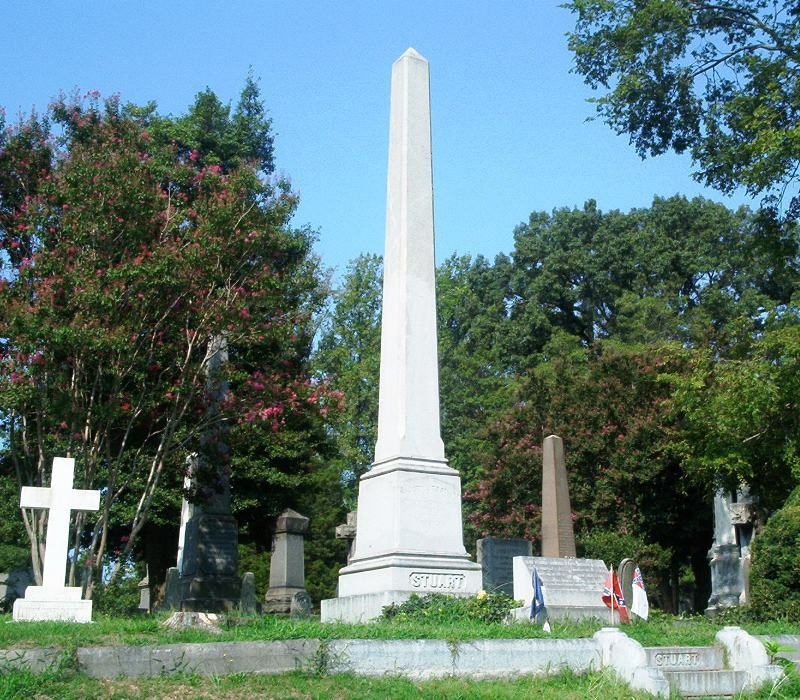 General Ambrose Powell Hill was killed April 2, 1865. He was first buried in the Winston Family Cemetery near Richmond. 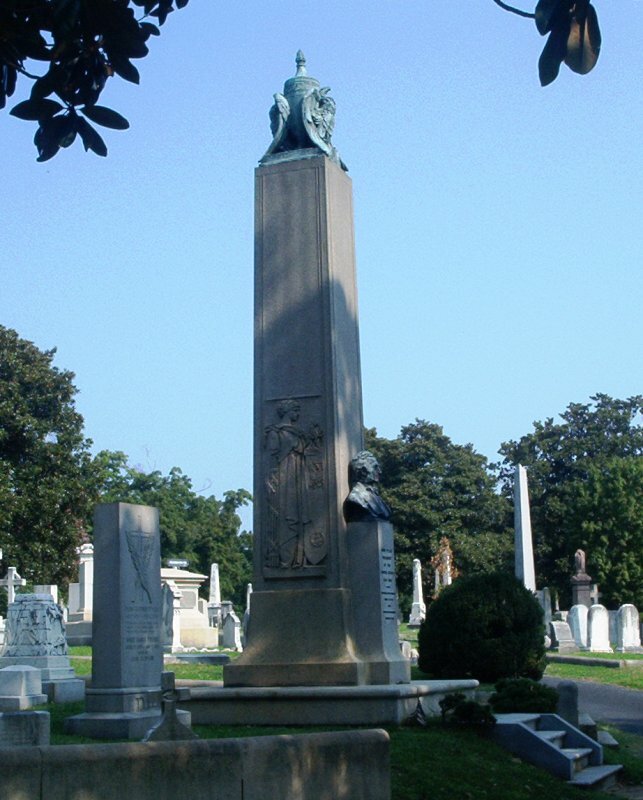 In 1867 he was moved to Hollywood Cemetery. 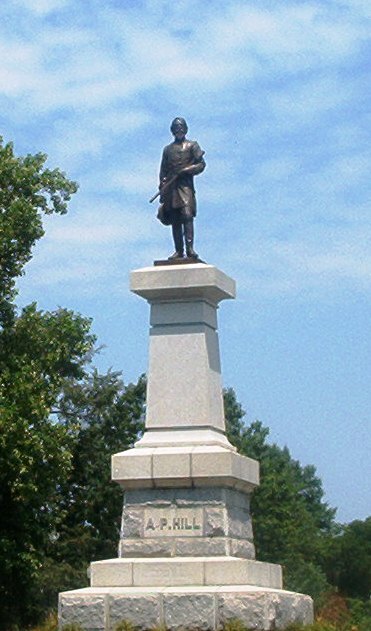 In 1891 General Hill's remains were, once again, disinterred and placed at the base of his monument at the busy intersection of Laburnum and Hermitage in Richmond. It was donated by the wealthy Confederate Major Lewis Ginter. Photographed 27 July 2007 and Contributed by George Seitz. 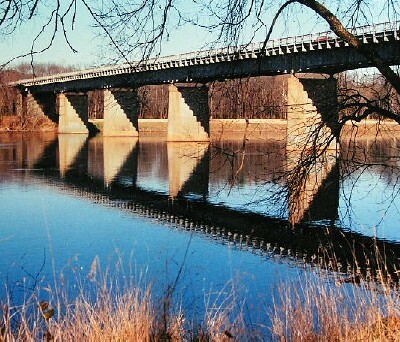 Built in the 1940's, the two lane bridge is still heavily used in travel across the James River, between the west end and south Richmond. 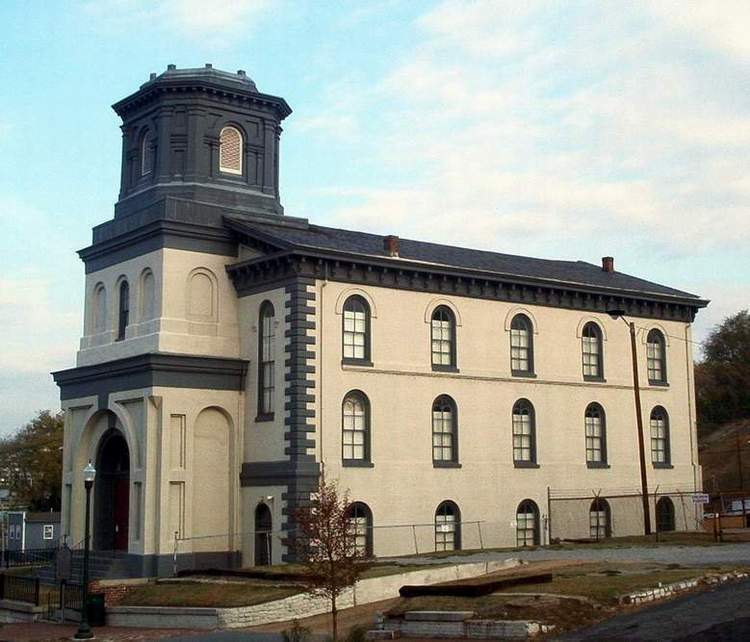 Built about 1831, Southern Railways, the railroad line on which the station was built, served the Confederate Navy Yard during the Civil War and the station welcomed travlers from around the region into Richmond. 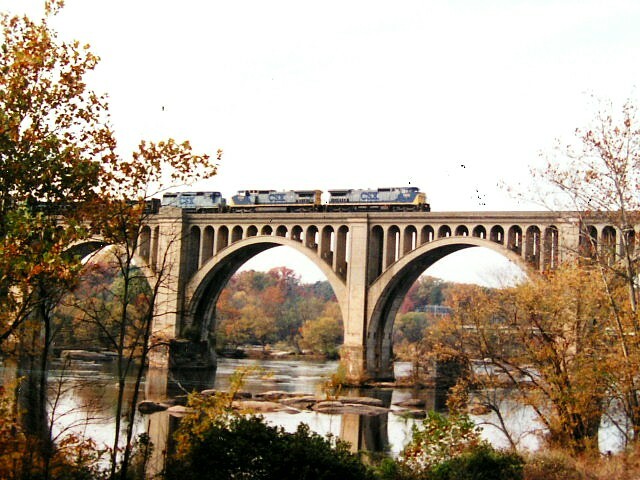 After World War 1, Southern Railway stopped passenger service to Richmond. Today it's the Old Dominion Railway Museum. 900-902 Park Avenue. 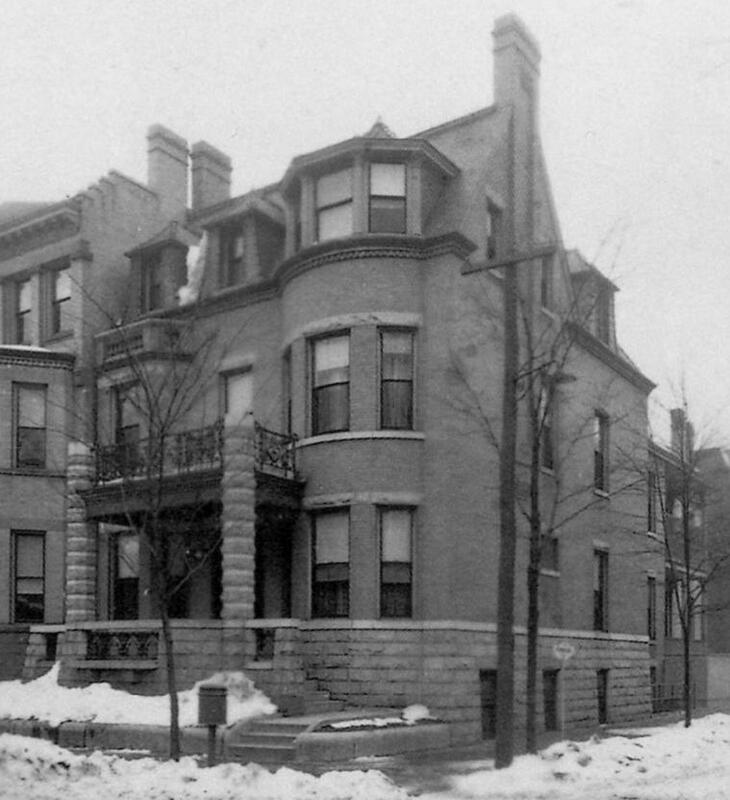 Gilbert Hunt bought John Shafer's former homestead at the corner of Park Avenue and Shafer Street and replaced the old house with this home, in 1896. 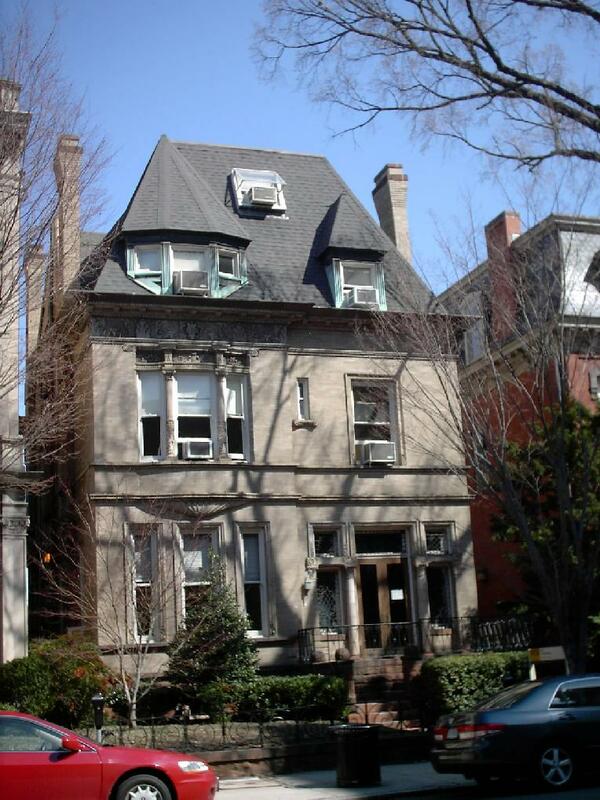 Local architects Noland and Baskervill established a presence on West Franklin Street from the turn of the century to their 1914 plans for the Eppa Hunton, Jr. House. 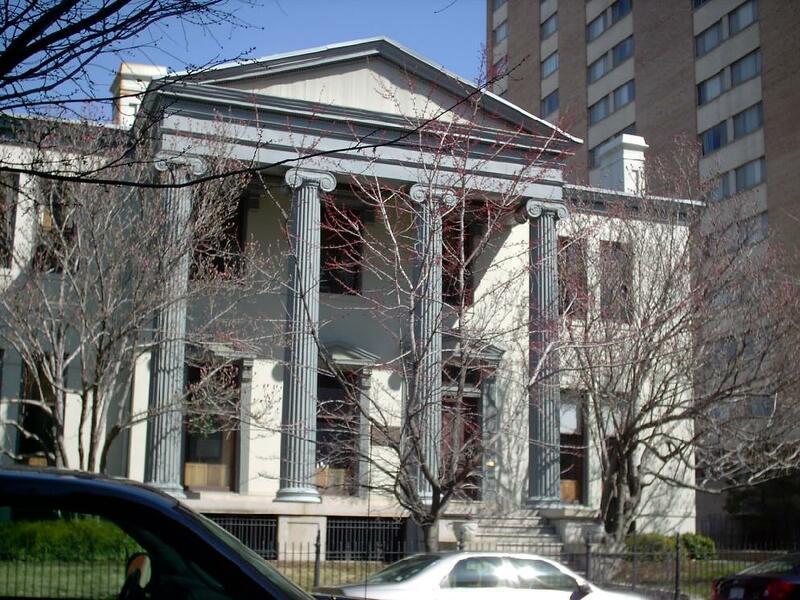 Built at a time when apartment buildings were eclipsing single-family mansions, 810 West Franklin Street was the last single residence built on the 800 and 900 blocks of West Franklin Street. Finished in 1916. View from Broad Street in the morning. 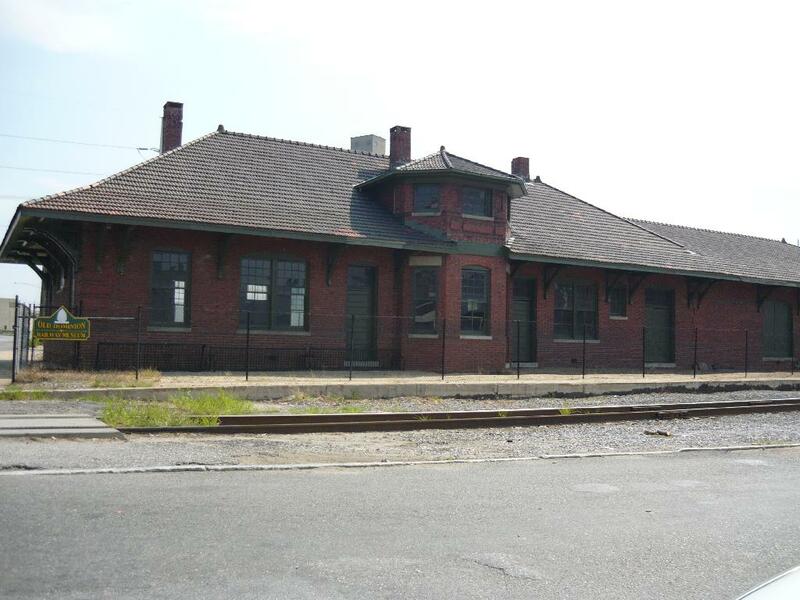 The building that I95 curves around is the Main Street railway station which has recently been revitalized to handle Amtrak passengers again. At Boulevard and Monument Avenue. By F. W. Sievers. Unveiled in 1919. It shows Jackson facing North. 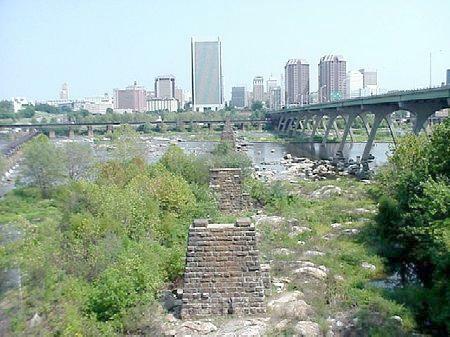 Showing the stonework of the pre-civil war Richmond and Petersburg railroad bridge. The Canal basin was where the twin buildings are to the right. 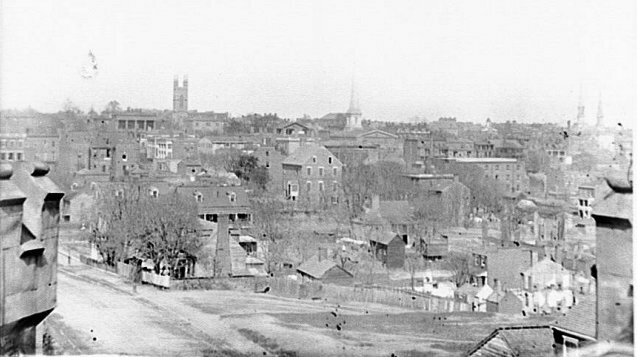 The railroad went up the center of the street and appears in many of the 1865 photos of the ruins of Richmond. View of the interior. 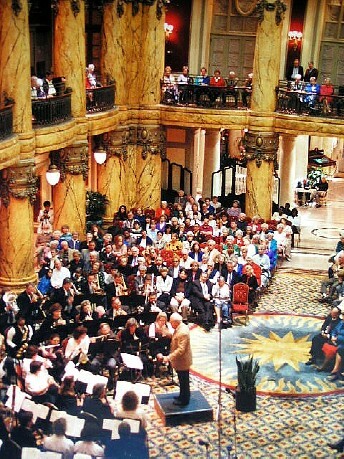 People look forward to the free concerts of the Richmond Pops Band in this splendid setting. Designed by prominent local architect, Capt. Marion J. Dimmock. It was built 1880-1891 by local contractor and builder T. Wiley Davis for William Henry Jones, a tobacco merchant of Richmond. 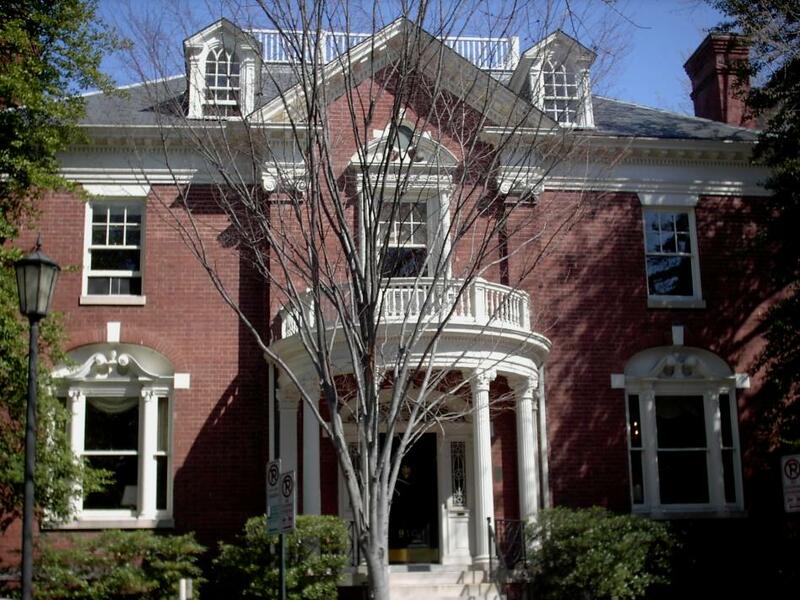 Jones sold it in 1899 to A. D. Williams, son of tobacco magnate T.C. Williams, Sr. A.D. Williams was a partner in Grubbs & Williams, real estate agents and auctioneers, until forming a new partnership with N.W. Bowe in 1884, creating Williams & Bowe, Real Estate and Loans. It was acquired by the Richmond Professional Institute in June 1952, at which time alterations were undertaken to divide up the space. At 6 North Laurel Street. Formerly "The Mosque", the theater was built in 1926 by Shriners as their Acca Temple Shrine. 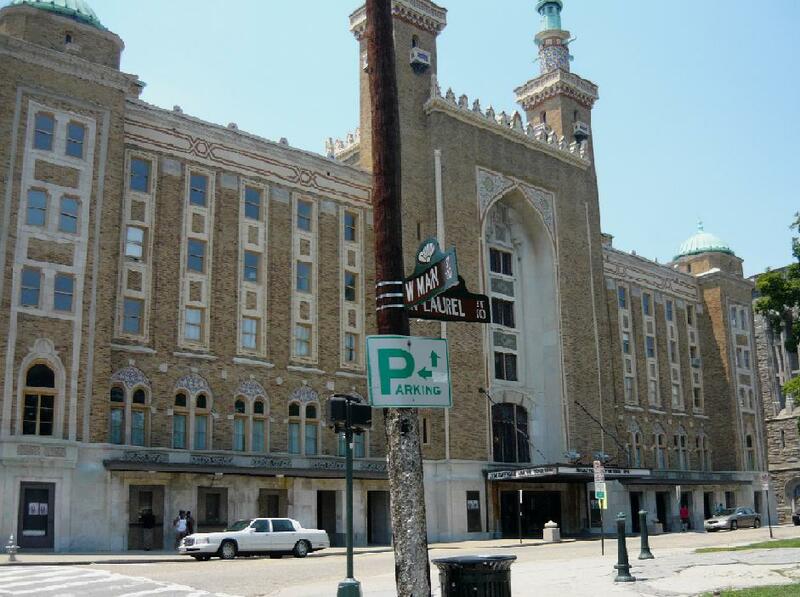 The city of Richmond, Virginia bought the facility in 1940 and eventually renamed it as the Landmark Theater. 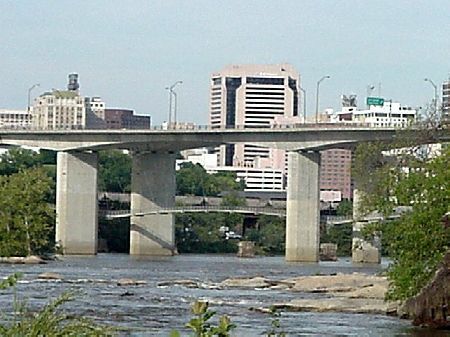 Richmond, Virginia. 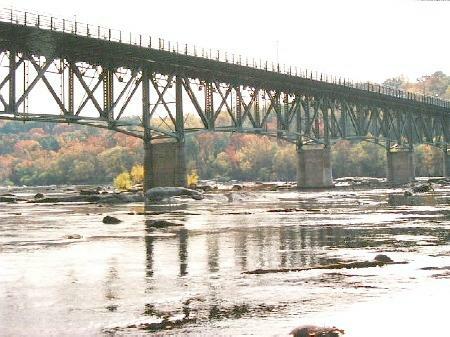 This is a view from Belle Isle of the Robert E. Lee Bridge crossing the James at Richmond. At 707 East Franklin Sreet. 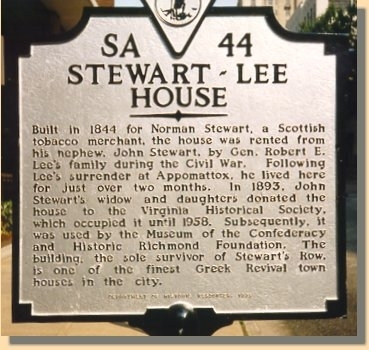 It is the home General Lee and his family occupied during the Civil War. Photographed Sep 3, 2007 and Contributed by George Seitz. At Allen and Monument Avenues. By M. J. A. Mercie. Unveiled in 1890. 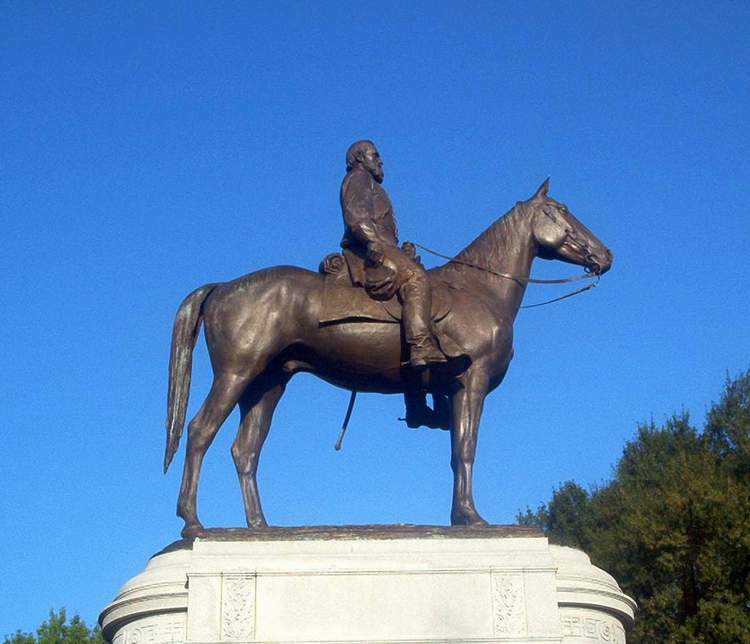 The only inscription is "Lee." 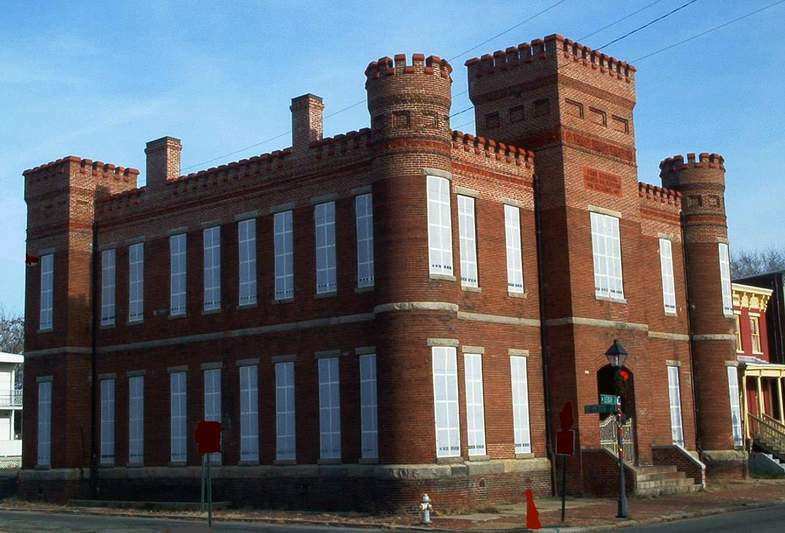 Originally named the First Virginia Volunteers Battalion Armory, it is the oldest armory building still standing in the state and was built specifically for an all-black battalion of local militia in 1895. Photographed Dec 2007 and Contributed by George Seitz. 1000 East Clay Street. Original owner John Wickham, built 1812-1816. Leigh, son-in-law of John Wickham, lived in this house from 1826 until his death in 1849. He was a U. S. Senator and one of the most distinguished lawyers of his day. He died February 2, 1849, and was buried in Shockoe Cemetery. Today it's part of Virginia Commonwealth University . At 103 East Franklin St. The land on which Linden Row Inn sits was originally part of a 100 acre tract owned by Thomas Rutherfoord, who amassed a fortune in tobacco, milling and real estate. 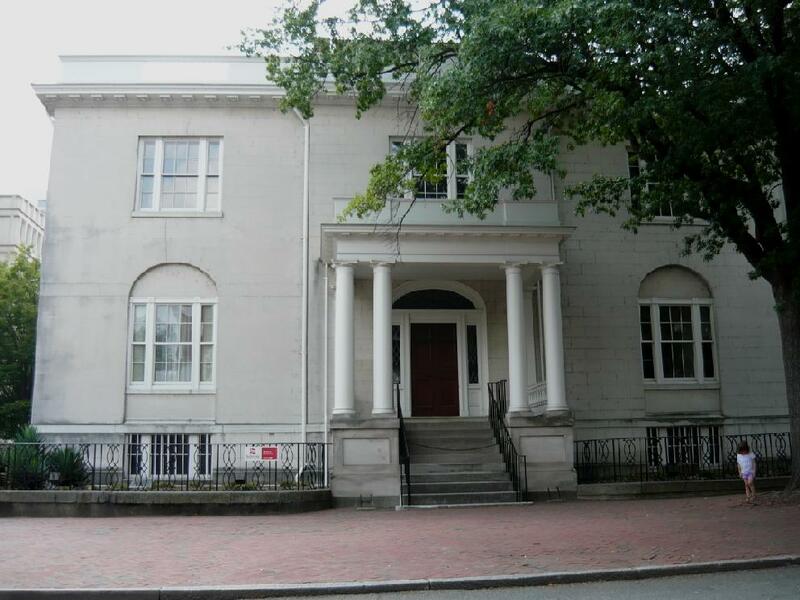 In 1816, Charles Ellis acquired the eastern end, across from his home on Franklin Street. Ellis used the land as a garden which was known for its beautiful roses, jasmine, and lindens. Between 1847 and 1853, the land was purchased by Fleming James, and Samuel and Alexander Rutherfoord, and a row of 10 houses were built. 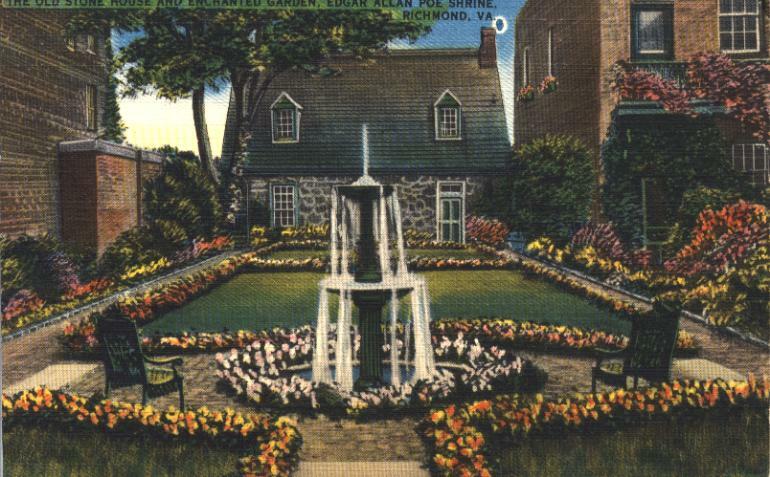 It was named Linden Square after the lindens that adorned the Ellis garden. 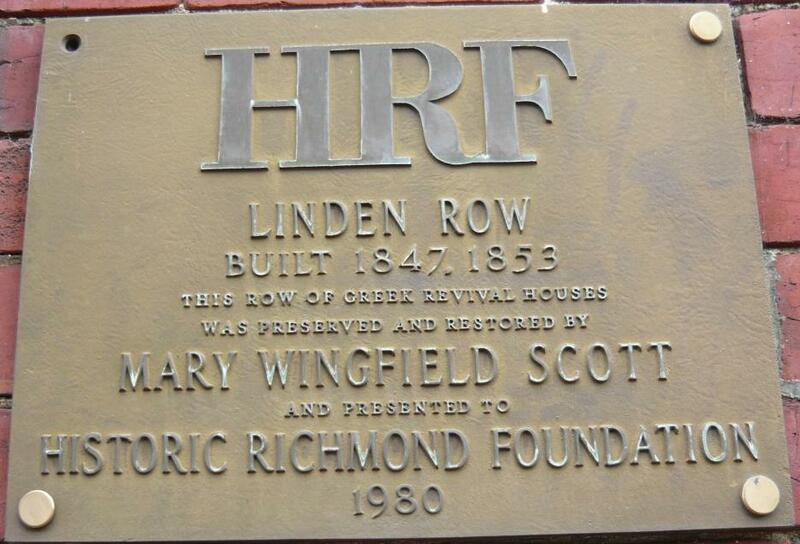 "Historic Richmond Foundation" Plaque on building's exterior. Marion J. Dimmock designed it for Mrs. William Triplett in 1877. It now serves as an administration building for Virginia Commonwealth University. Opened in 1901 it endured floods and neglect, closing in 1975. It reopened in 1985 as a shopping mall that lasted only two years. In 2003 it reemerged as a train station. 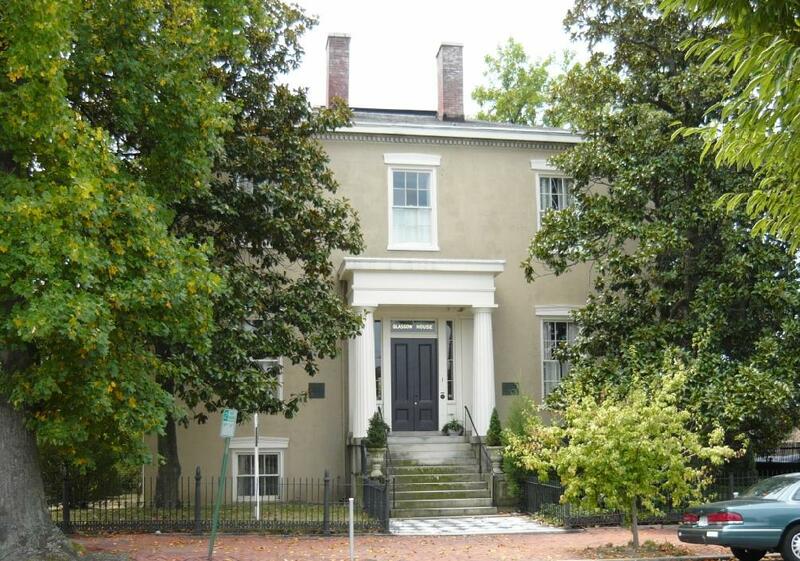 The home was built in Richmond's Court End and was the largest in the city when he and his wife Mary Willis Amber Marshall moved in, in 1790 and he lived there with his family until his death in 1835.Today it is the oldest brick home in Richmond." opened in 1929, at 502 East Franklin Street. 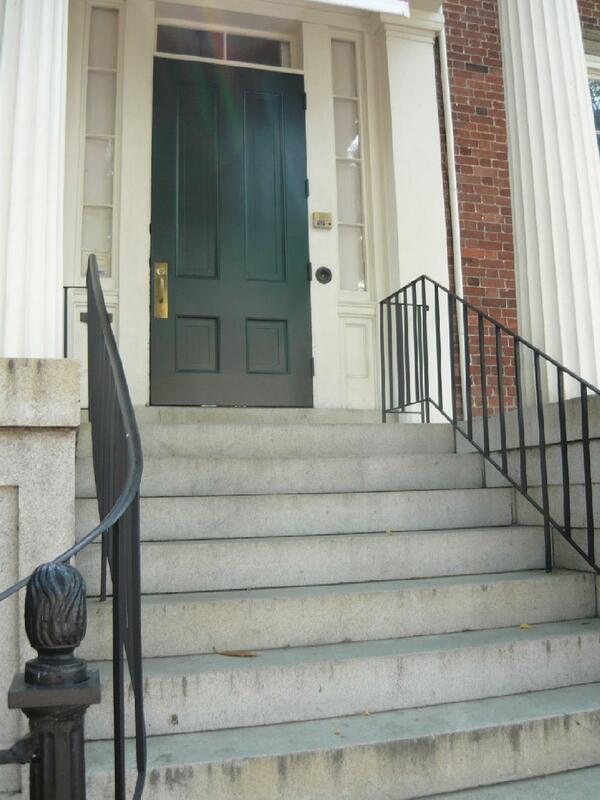 Built in 1785, it was financed by a lottery. 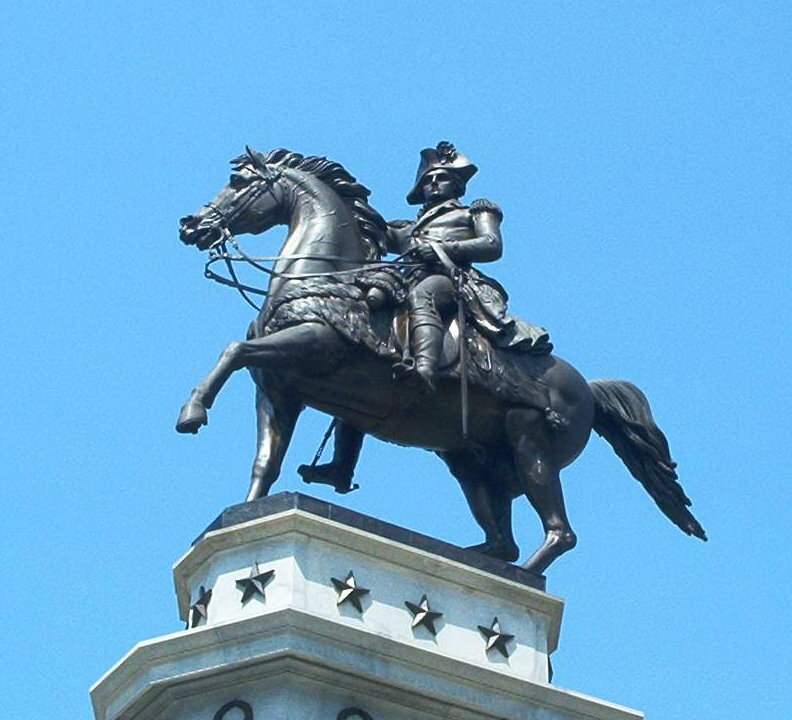 George Washington visited there, as did the Marquis de Lafayette and King Edward of England. Photographed Jun 2008 and Contributed by George Seitz. 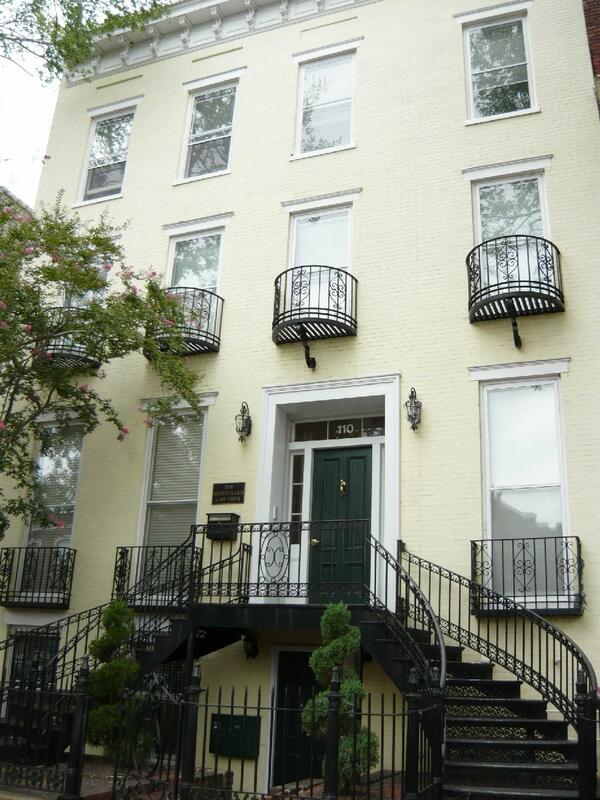 This was the home of Dr. Socrates Maupin, noted physician-educator. 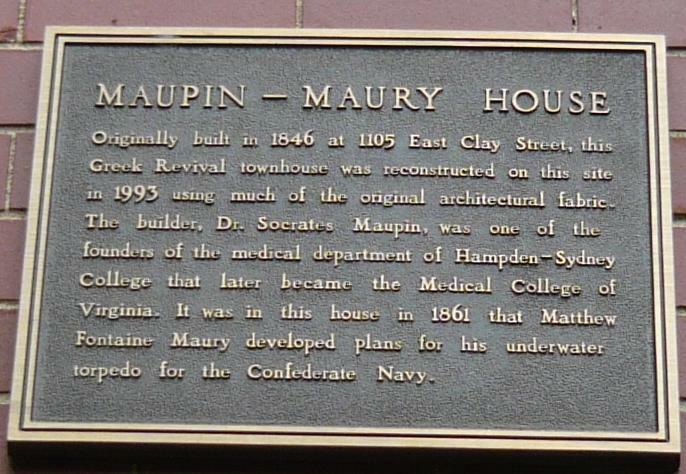 Dr. Maupin died in 1871 and is buried at the University of Virginia in Charlottesville. 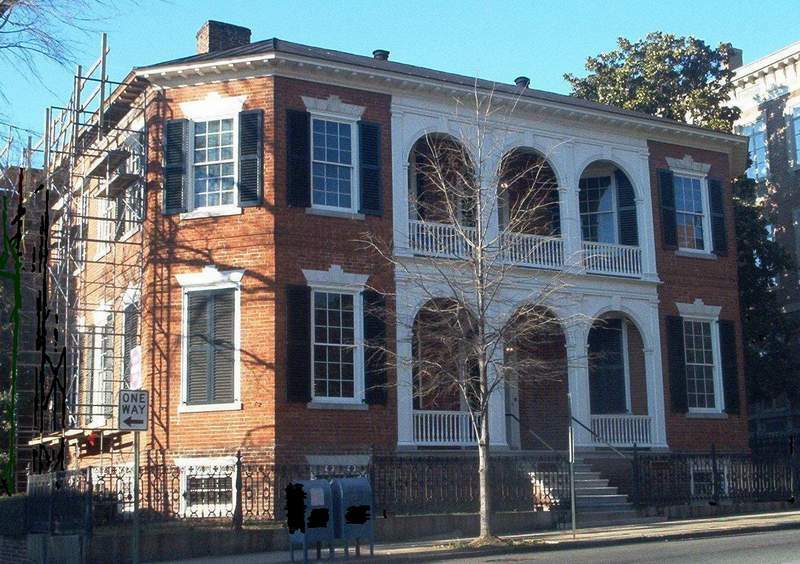 Later the house belonged to the Maury family, and the inventor Matthew Fontaine Maury lived here for a short time. Today it belongs to the Medical College of Virginia. 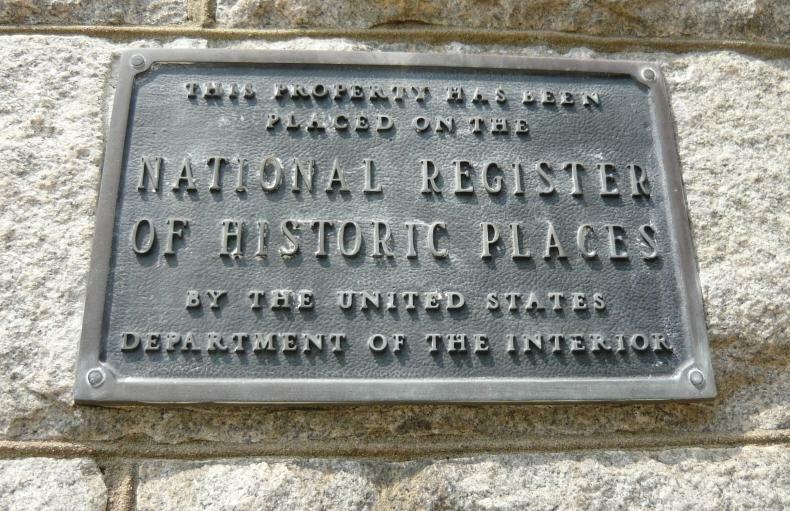 Plaque on history of house. 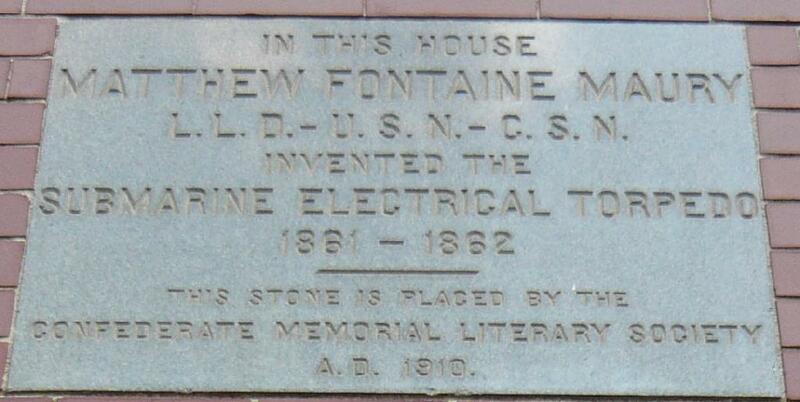 Plaque commemorating Matthew Fontain Maury's achievement. Unveiled in 1929, it sits at the corner of Monument and Belmont Avenue. 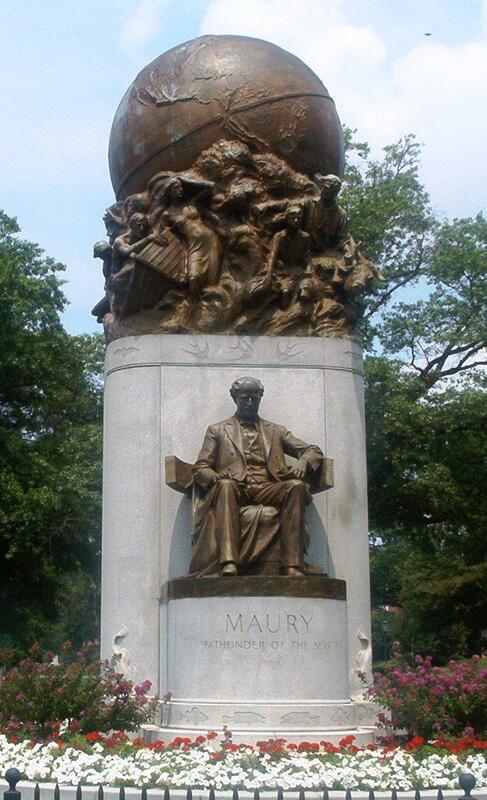 Maury faces East and is seated in front of a large globe with figures struggling with the sea and the land. The 100-acre Victorian country estate of James Henry and Sallie May Dooley. 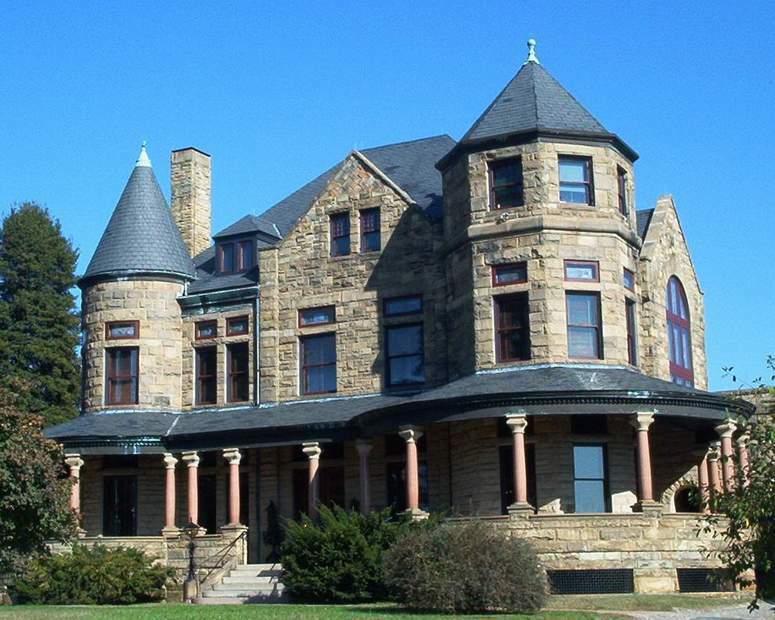 The Romanesque-style mansion was completed in 1893. Only six months after Mrs. Dooley's death in 1925, it opened as a public park and museum, and has survived intact. 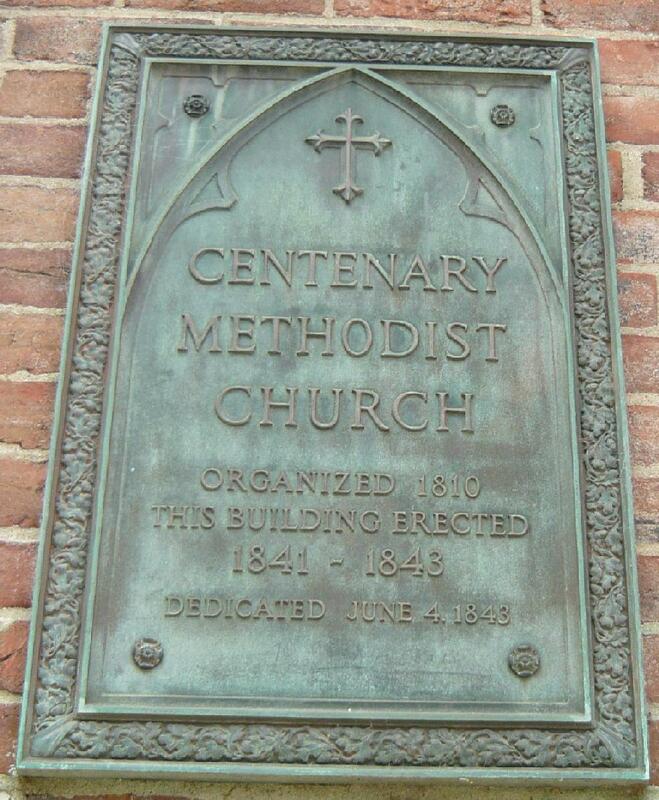 The Church House of The Diocese of Virginia, known as Mayo Memorial Churuch House, at 110 West Franklin Street. 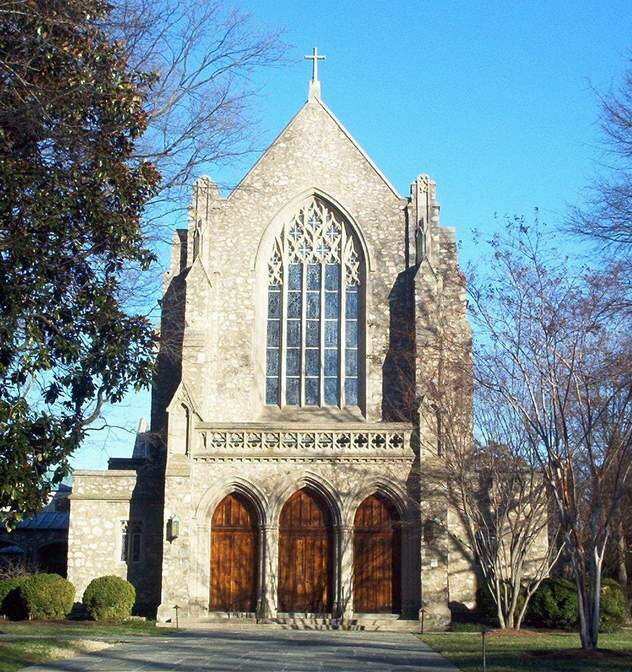 Built in 1841 and enlarged by tobacconist Peter Mayo in 1884, the house was given to the Episcopal Diocese of Virginia by Mayo's daughters in 1923. In Capitol Square. Designed by William Cooper. Unveiled in 1904. McGuire was President of the American Medical and American Surgical Associations. 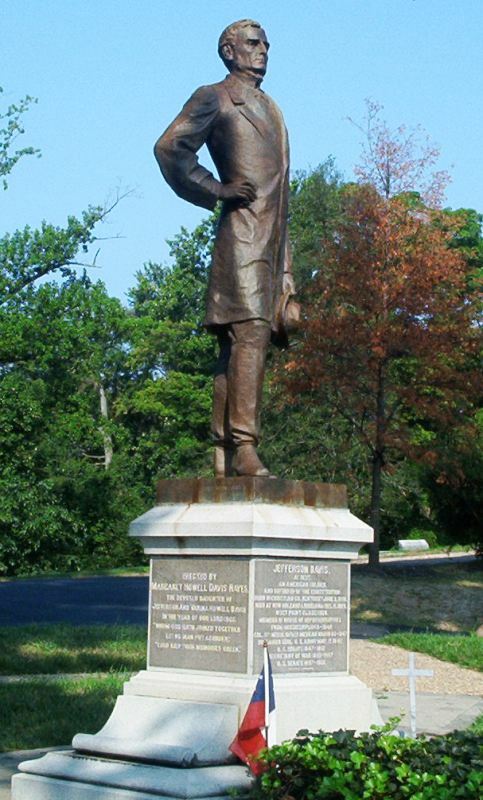 He was Medical Director of Jackson's Corps of the Army of Northern Virginia. Built for Dr. Stuart McGuire in 1924 by Baskervill and Lambert. 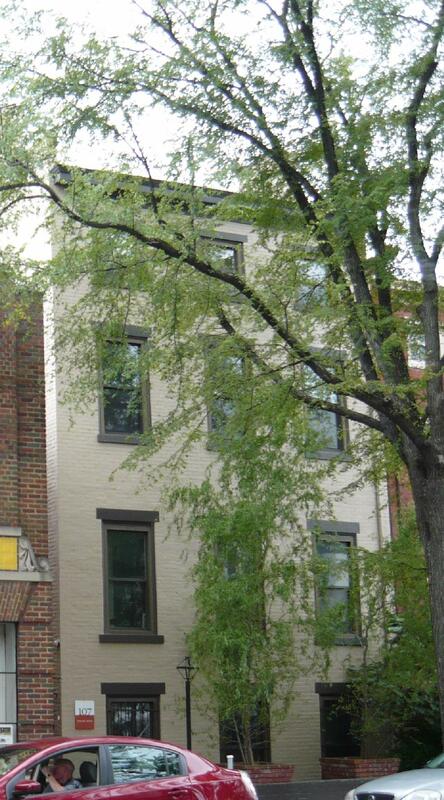 It is at 2304 Monument Avenue. 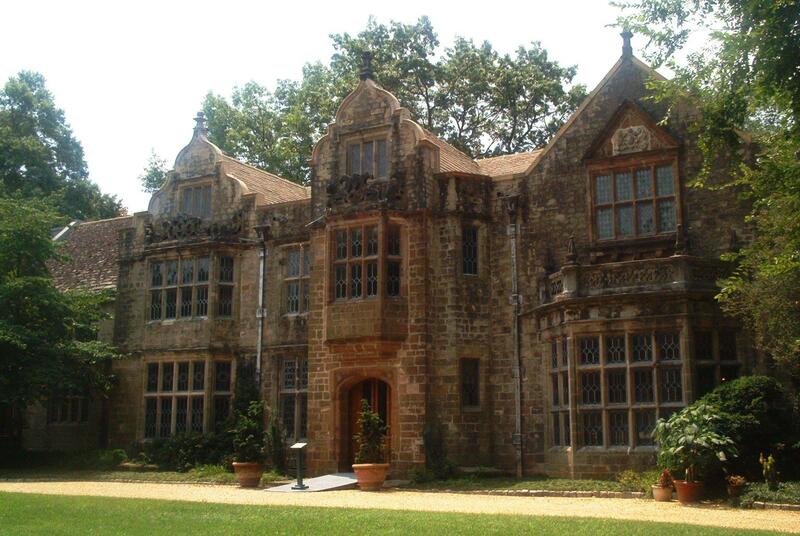 It is modeled after an English manor house and was in the film "Sense and Sensibility." Photographed Mar 7, 2010 and Contributed by George Seitz. 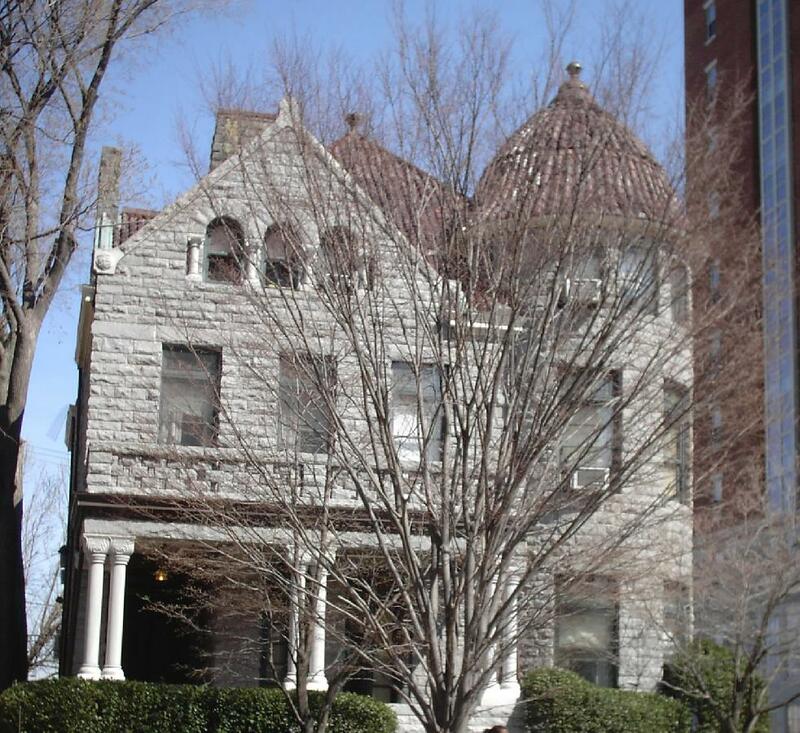 Architect William M. Poindexter, WDC, built this Moorish-inspired home, 1891-1894, for Samson Hirsh & Gustavus Millhiser. Gustavus was brother of Hirsh's wife Amelia and partner in Moses Millhiser & Co. In Hollywood Cemetery. Monroe (1758-1831) was an officer under Washington during the Revolution, a US Senator, Governor of VA, Secy of State, Secy of War, and the fifth United States President (1817-1825). 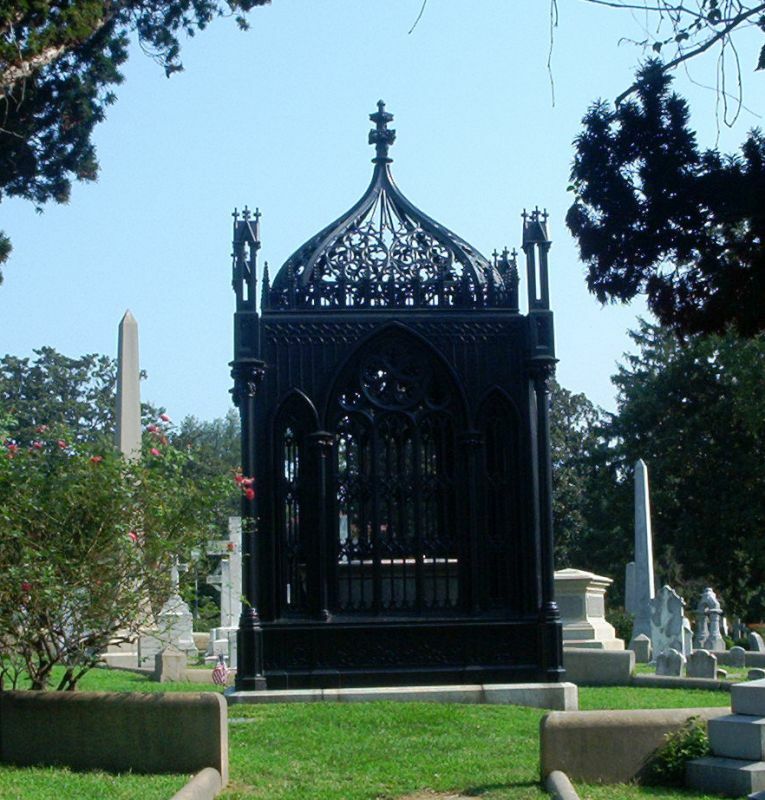 He first buried at Marble Hill Cem, New York, but was moved to Hollywood Cem in 1858. Designed in 1912 by the New York architect Alfred C. Bossom, later Lord Bossom. 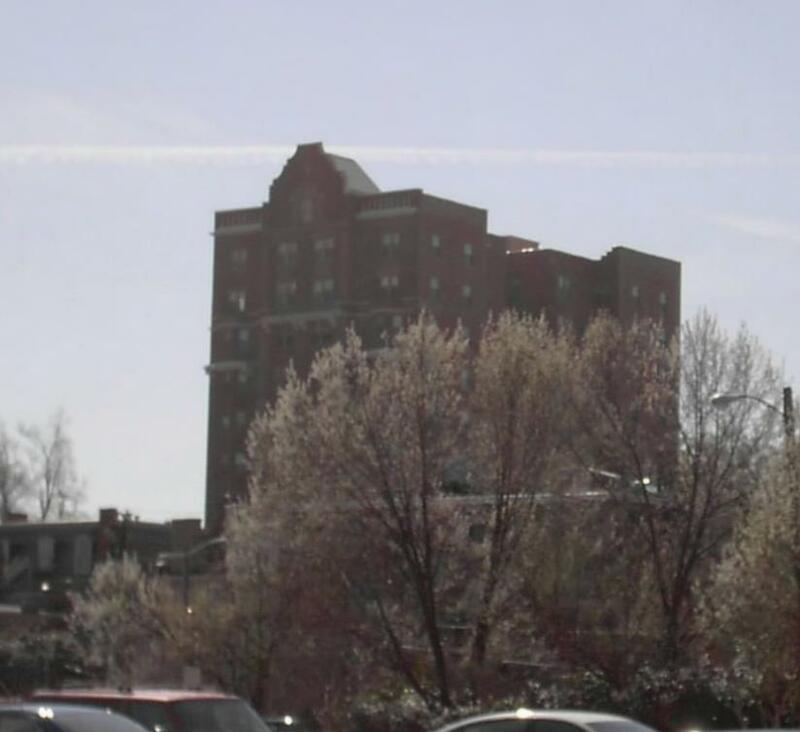 At twelve stories overlooking Monroe Park, the apartment building was the largest to date in the residential quarter. The wood frame house that stood on the site was moved to the North Side. The original house was owned by. Col. Albert Ordway. 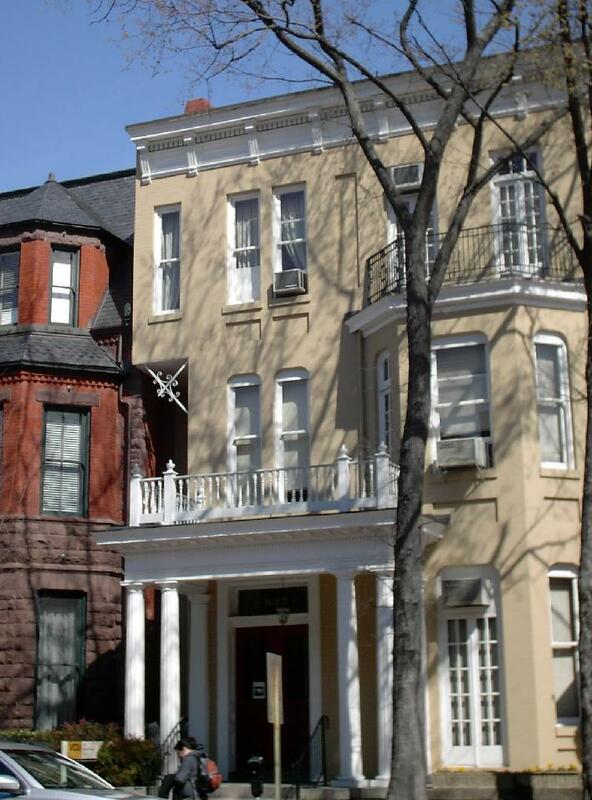 Noland and Baskervill designed this Colonial Revival townhouse in 1907, then were hired to redesign the interior seven years later. 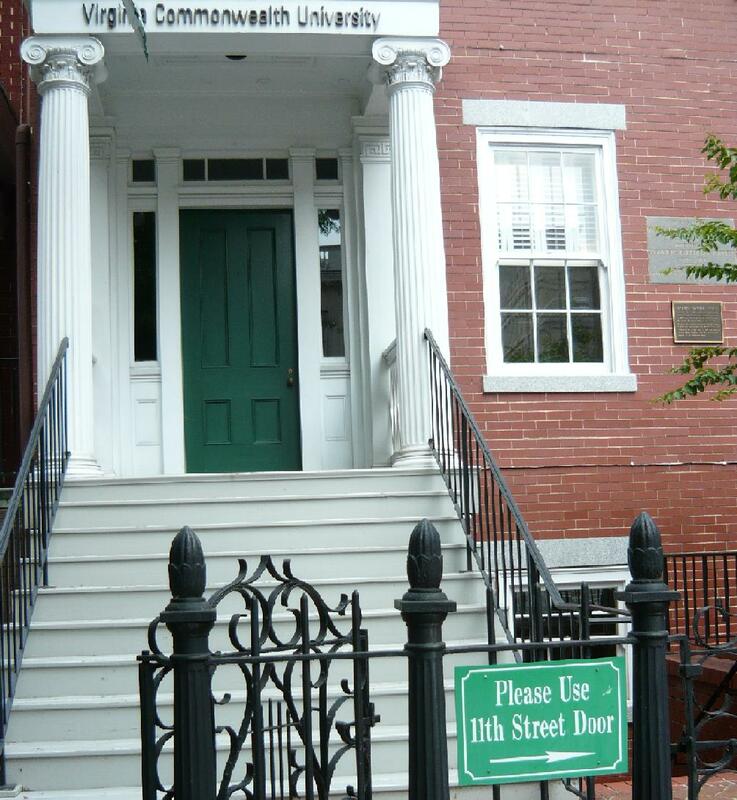 The townhouse was built long and narrow for the lot, for Edmund Trowbridge Dana Myers, Jr., Civil Engineer, and wife Grace. 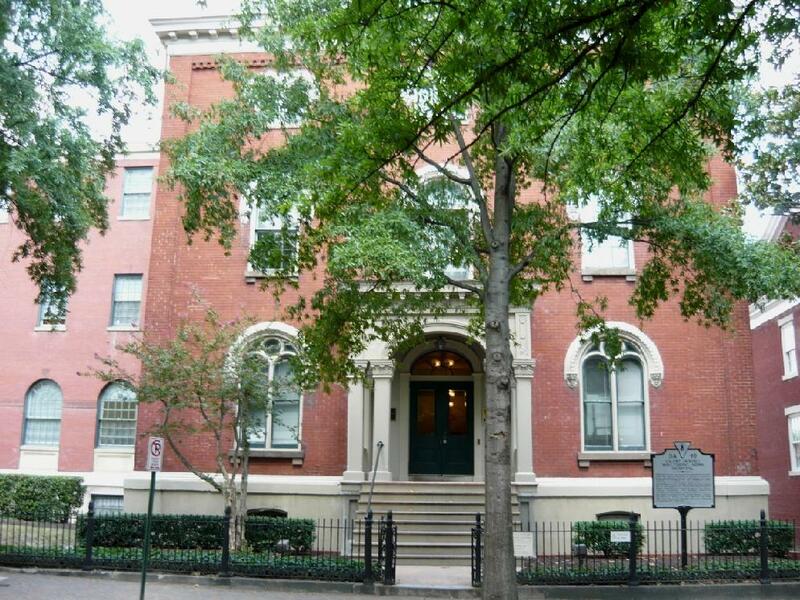 The Myerses sold the house in 1914 to Henry W. Anderson, partner in Munford, Hunton, Williams, and Anderson. Anderson called upon the original architects of the house to perform interior alterations in 1914. Originally (early 1900's) the toll for this bridge across the James was five cents, and the name stuck even though the toll has increased. 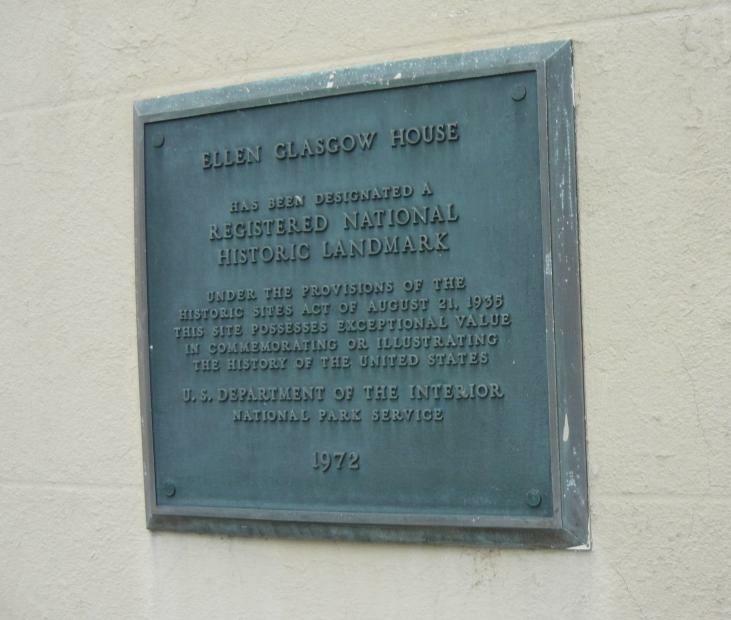 The Old Stone House - The oldest house in Richmond, erected about 1685, now a reliquary for material related to the life and work of Edgar Allan Poe. 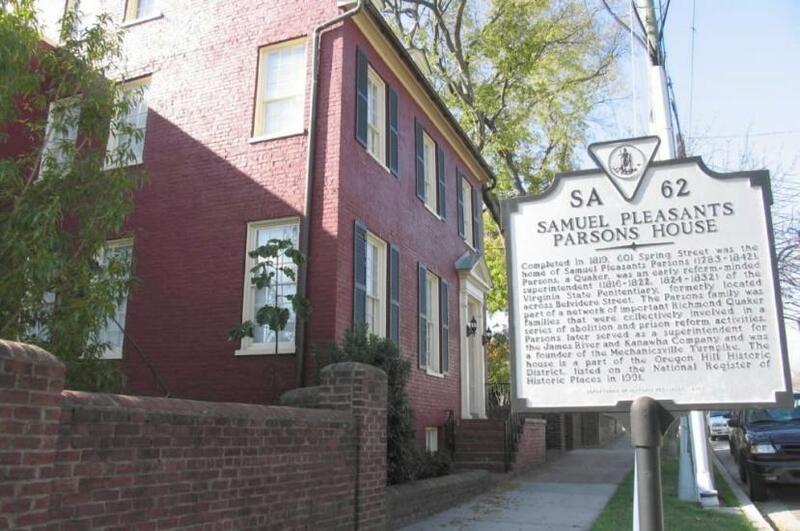 Built in 1819, Samuel Parsons was superintendent of the penitentiary: he lived close to his work. 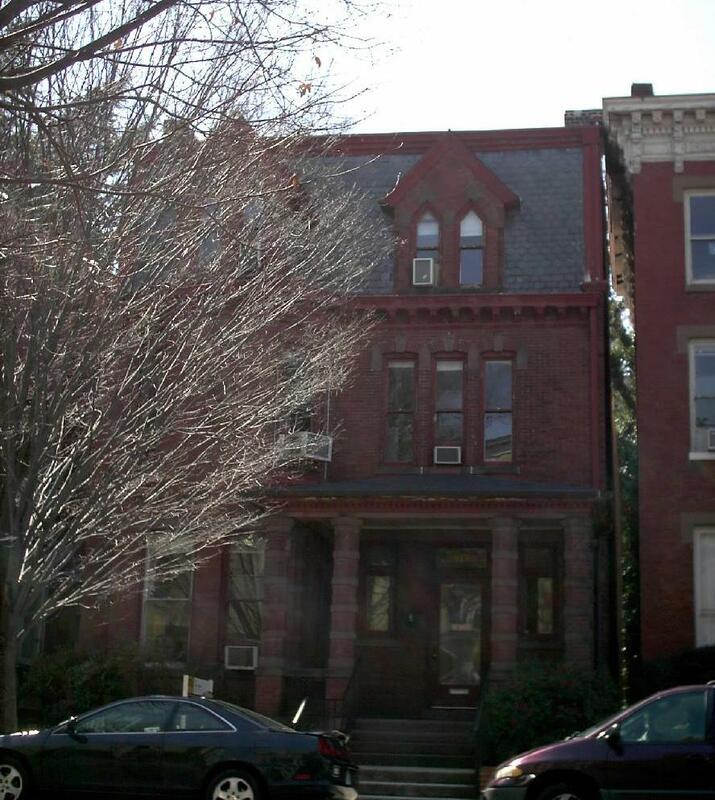 Later, as Spring Street Home, this house was a refuge for unwed mothers. In 1965 it was used as the state welfare offices. In Hollywood Cemetery. Pickett (1825-1875) Graduated last in his class at West Point, he won a brevet promotion in the Mexican War, fought Indians on the frontier. He rose to General in the Confederate States Army and is best remembered for his participation in the futile and bloody assault at the Battle of Gettysburg that bears his name, Pickett's Charge. 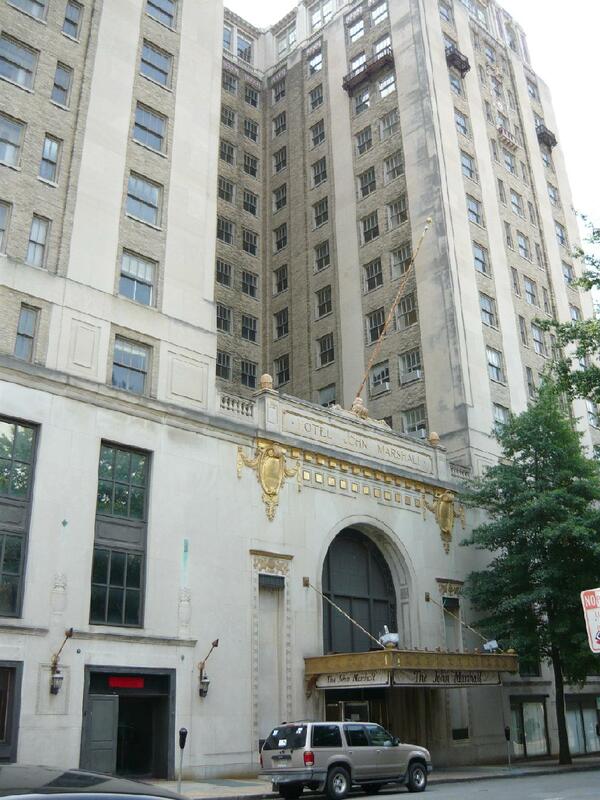 At 400 South Pine and Albemarle Street. Built in 1882. Also known as Oregon Hill Baptist Colony. Built in 1882 a technological marvel, fell into ruins after it was abandoned in 1926, now being restored as part of the James River Park System. 921 West Franklin Street. 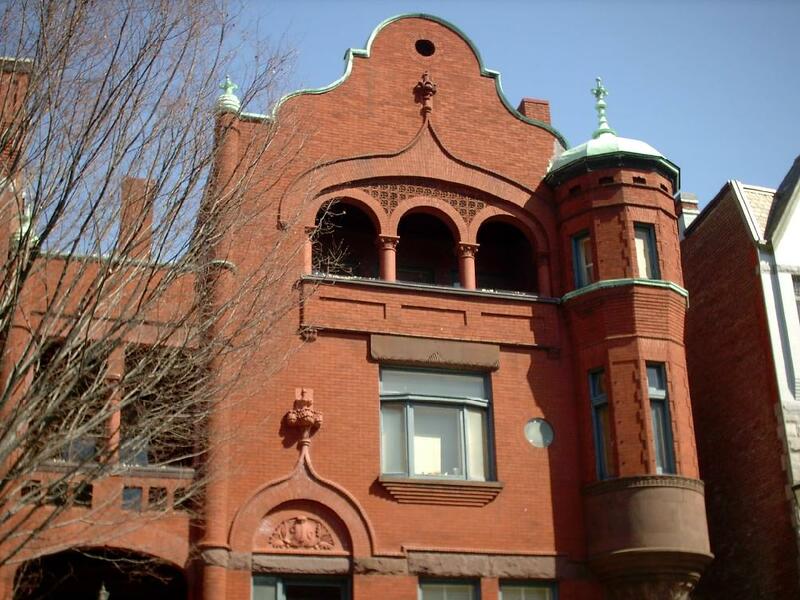 The local architect Albert F. Huntt was commissioned to design a townhouse in the Richardsonian Romanesque style. It was, like many of his neighbors' houses, built on a side-hall plan, and had a projecting semi-circular tower. 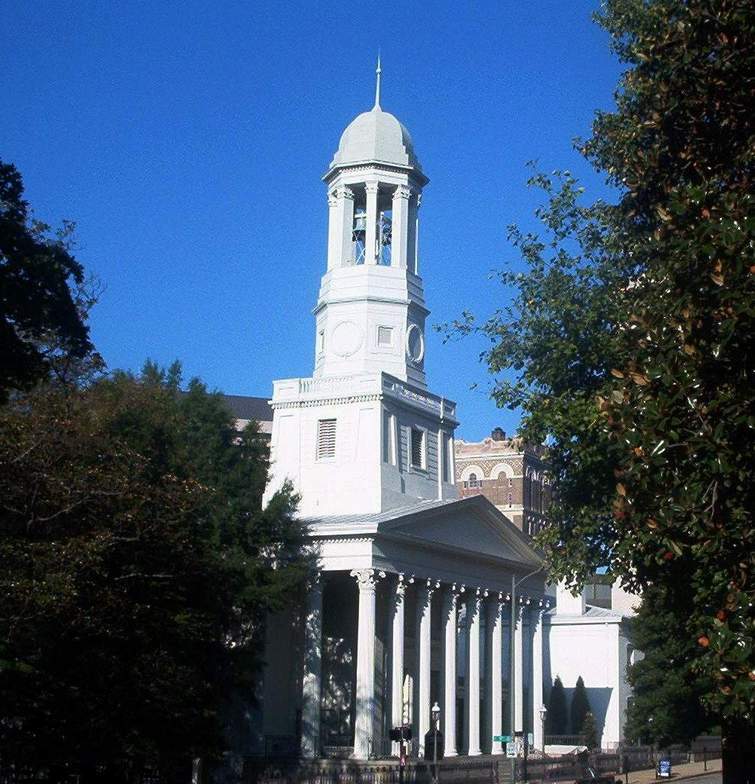 Stonework for the imposing structure was executed by William Mason, of the partnership Mason & Sim, Richmond, Virginia. Stephen Putney made his fortune in the wholesale shoe business, and purchased the land from Ella Williams in May, 1894, and from Charlotte and James Kearney in June of the same year. Built as early as 1720. Edgar Allan Poe was a guest there and John James Audubon was a frequent visitor. Robert E. Lee's troops camped on the grounds during the Civil War. 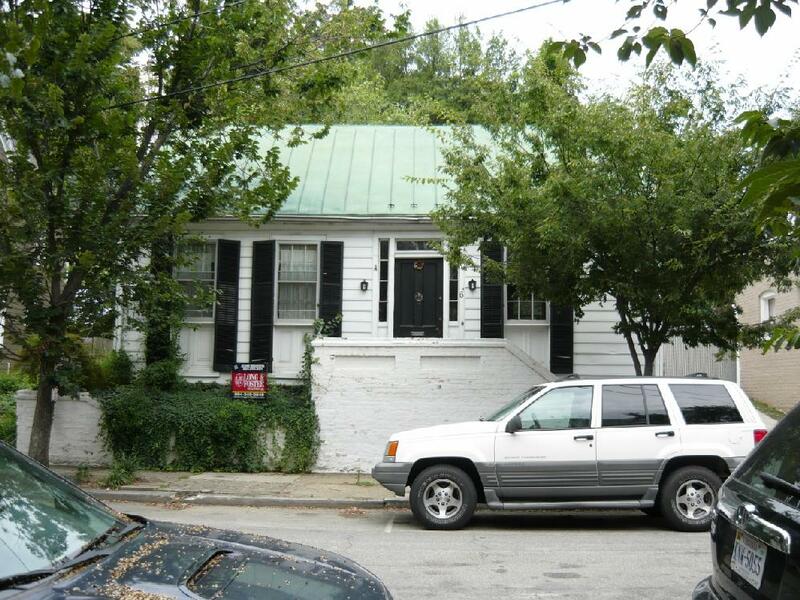 The earliest extant house on West Franklin Street. 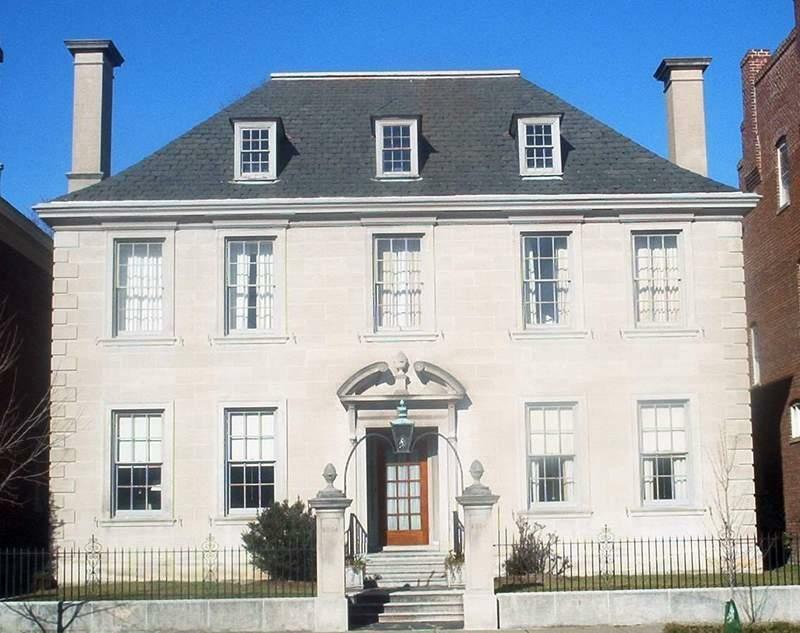 Built in 1855 for William C. Ritter, before this stretch of Franklin Street was incorporated into the city proper, the Italian villa was appropriate in its rural setting. 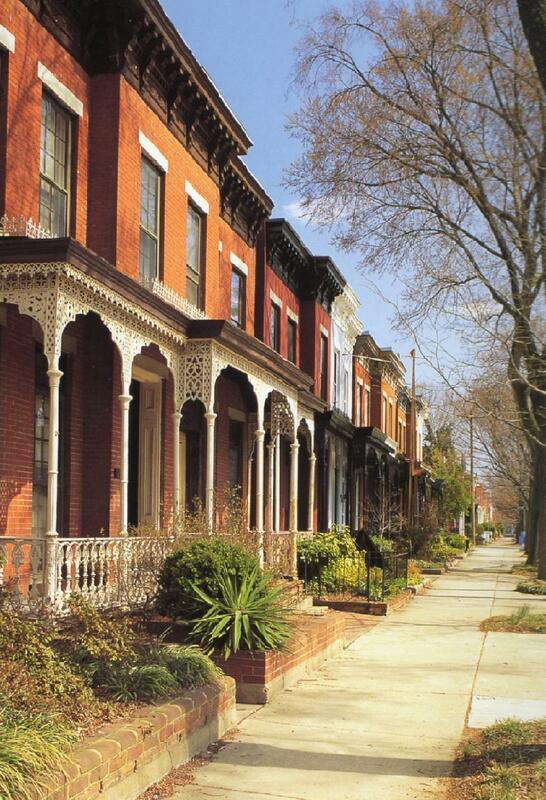 By the turn of the century, it was well within the city limits, and its new owner, Mrs. Belle Hickok of Baltimore. After Ritter, the house was occupied by Samuel L. Harwood, then R.B. Chaffin. Hickok bought the house in 1903. 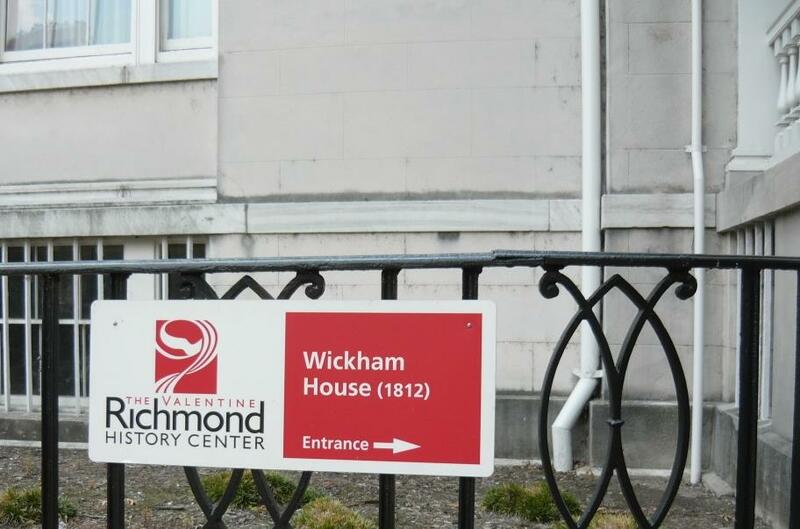 This building was purchased by the Richmond Professional Institute for $17,500.00 in December of 1939. 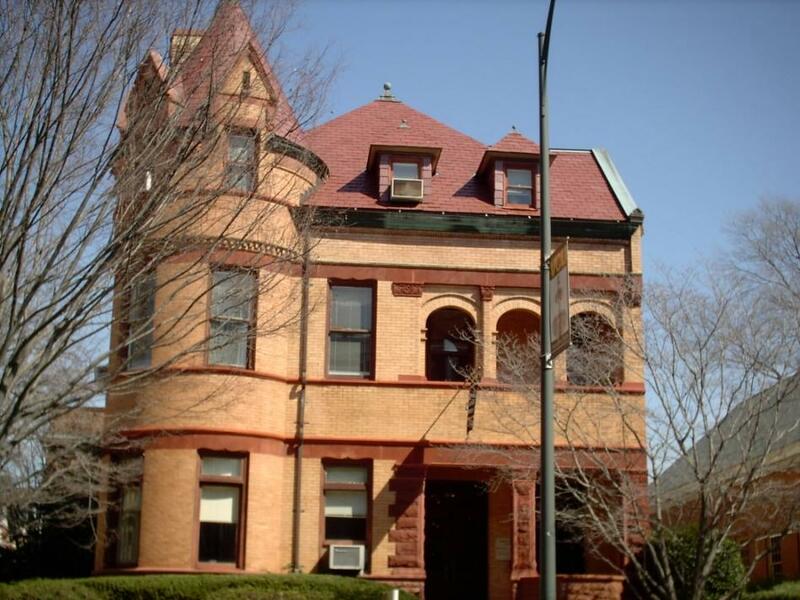 It was the sixth property acquired by the developing Institute and was initially used as a women's dormitory. 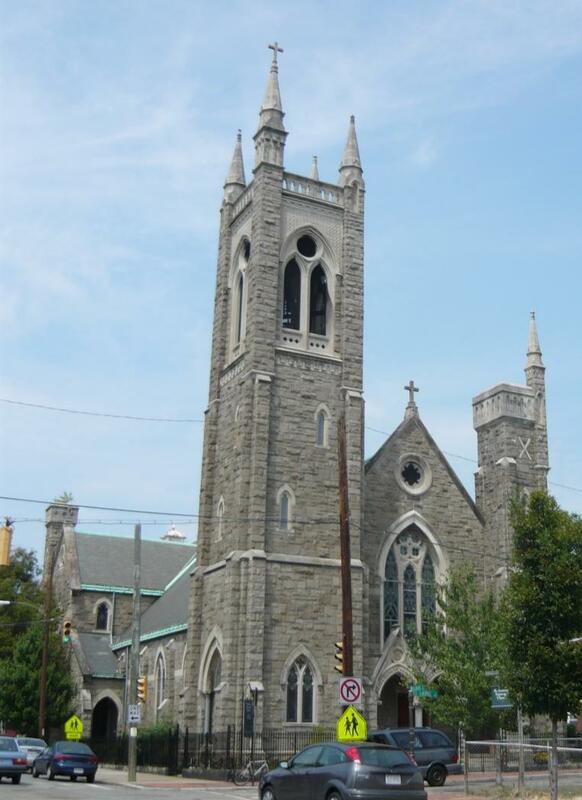 Oregon Hill, Laurel Street and Idlewood Ave. Gothic architecture advocated by A.W.N. Pugin and Ralph Adams Cram. 1900-1903, A.H.Ellwood,1904, parish hall, Noland and Baskervill. Built to replace an earlier frame chapel. Built in 1741 as part of the Henrco Parish. 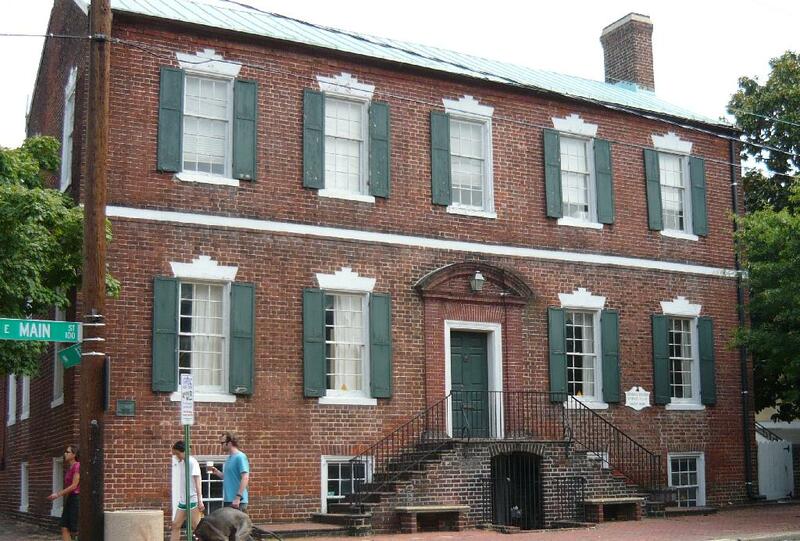 On March 23, 1775, Patrick Henry delivered his "Liberty or Death" speech here. George Washington and Thomas Jefferson were in attendance. Declaration signer George Wythe and Elizabeth Arnold Poe, Edgar's mother are buried here. Of the Corinthian order of architecture, it was completed in 1845. While attending service on April 2, 1865, Jefferson Davis was handed a dispatch from General Lee announcing the necessity for the evacuation of Richmond. Designed by Frank E. Watson and completed in 1928. 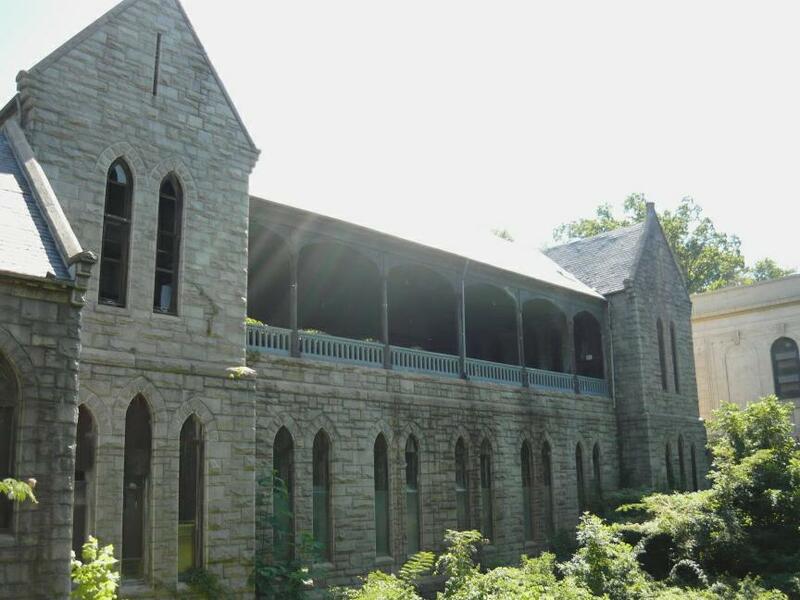 The Late Gothic Revival building is on the Virginia Landmarks Register. 827 West Franklin Street. Built in 1883 for E.A. Saunders, a highly successful wholesale provisions broker whose firm, E.A. 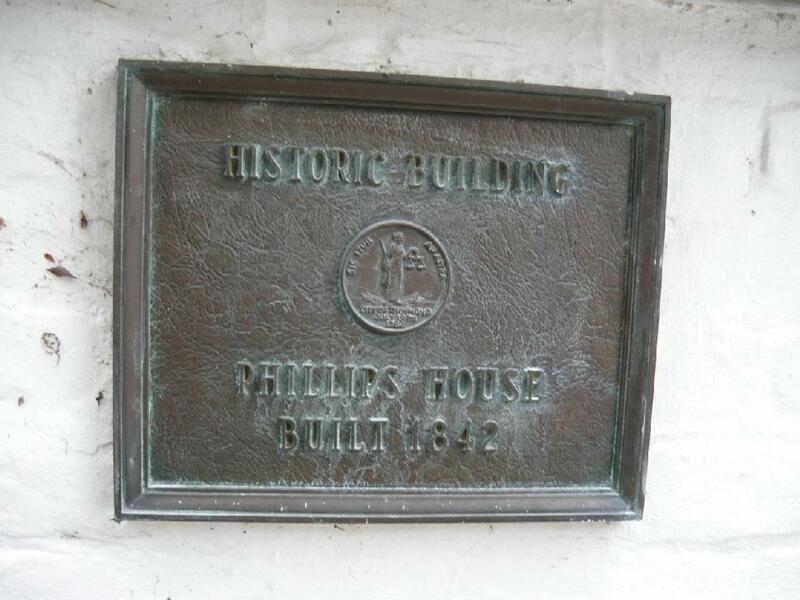 Saunders & Son,located at Fourteenth and Cary Streets, specialized in tobacco and tobacco manufacturers' supplies. 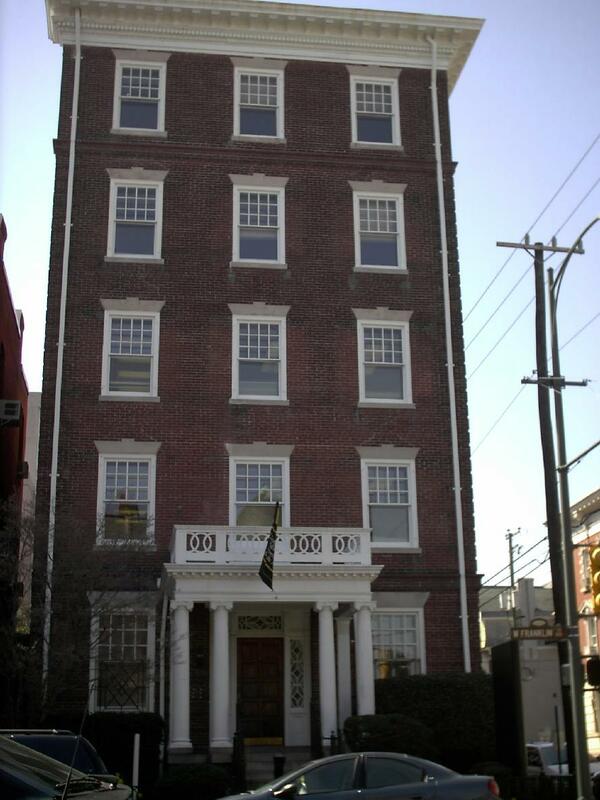 Today the house is known as the Founders' Hall at Virginia Commonwealth University. 9 North Fifth Street. Designed by Minard Lafever, organized in 1845 and built in 1847. First minister was Rev. Moses D Hodge 1847 till he died in February 1899. 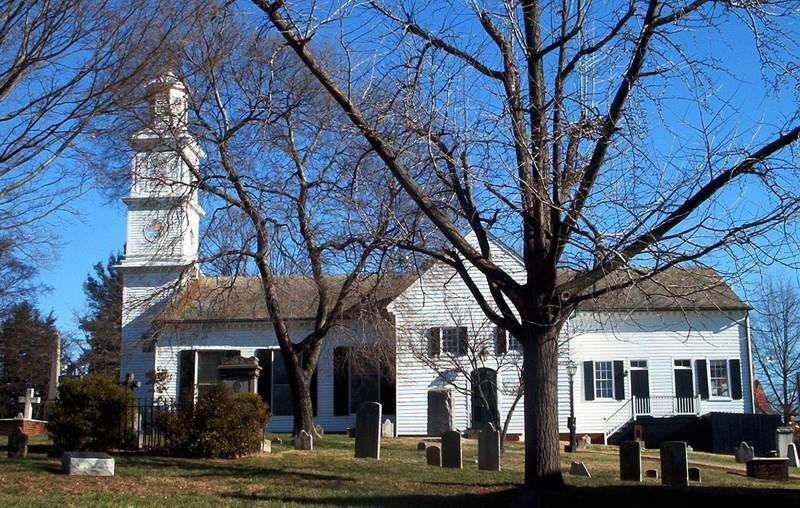 Stonewall Jackson worshipped here. 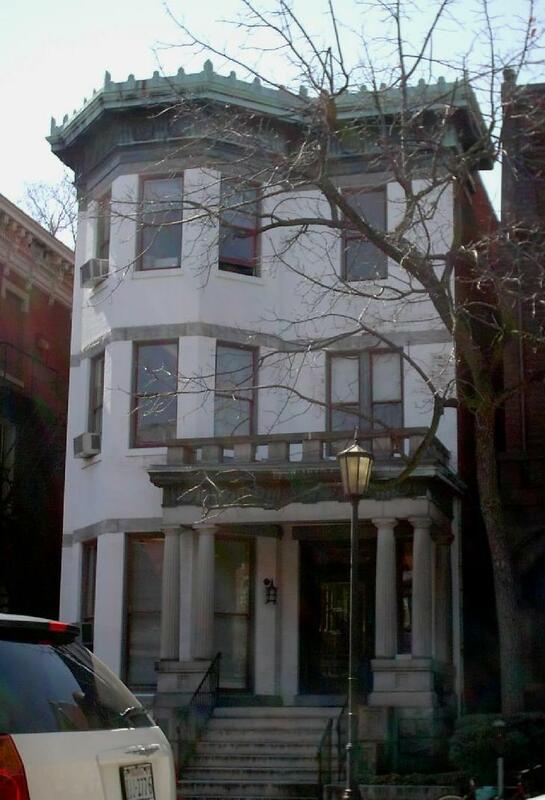 Built in 1885 at 915 West Franklin Street, for Ashton and Florine Dunlap Starke. 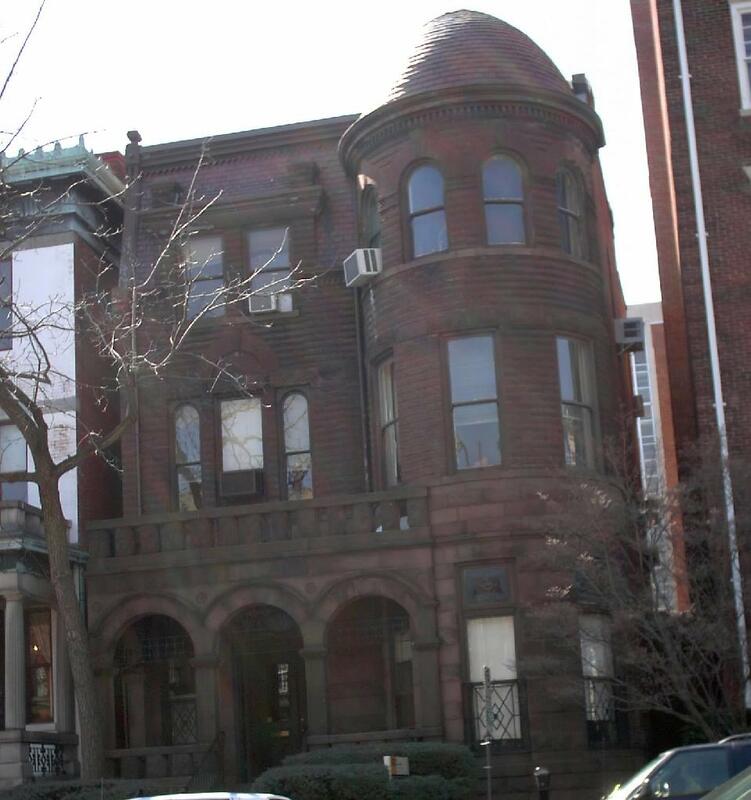 A remodelling in 1902 by Noland and Baskervill added octagonal porch columns constructed of brownstone dies inserted between brick work. Noland and Baskervill also added another wall-dormer with pair lancet windows to match the single existing dormer set against the French roof. A flower relief plaque of molded brick is set into the front of projecting the polygonal bay. Starke, a dealer in agricultural implements, was instrumental in the success of the 1888 Virginia Exposition at Fair Grounds, and was involved in Commonwealth Club and served for 2 years as president. In Hollywood Cemetery. J.E.B. 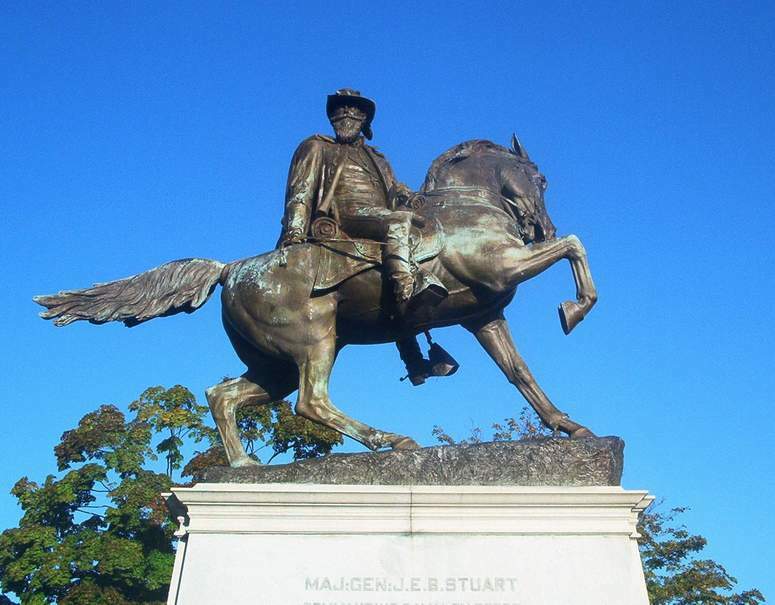 Stuart (1833-1864) was a cavalry commander known for his mastery of reconnaissance. Nicknamed "Beauty" at West Point, he served on the frontier agains the Indians, and in Kansas during the border disturbances. He rose from Capt. to the rank of Major general in the Confederate States Army. He was mortally wounded May 11, 1864 at the battle of Yellow Tavern. Photographed 26 Aug 2007 and Contributed by George Seitz. At Lombardy and Monument Avenue. 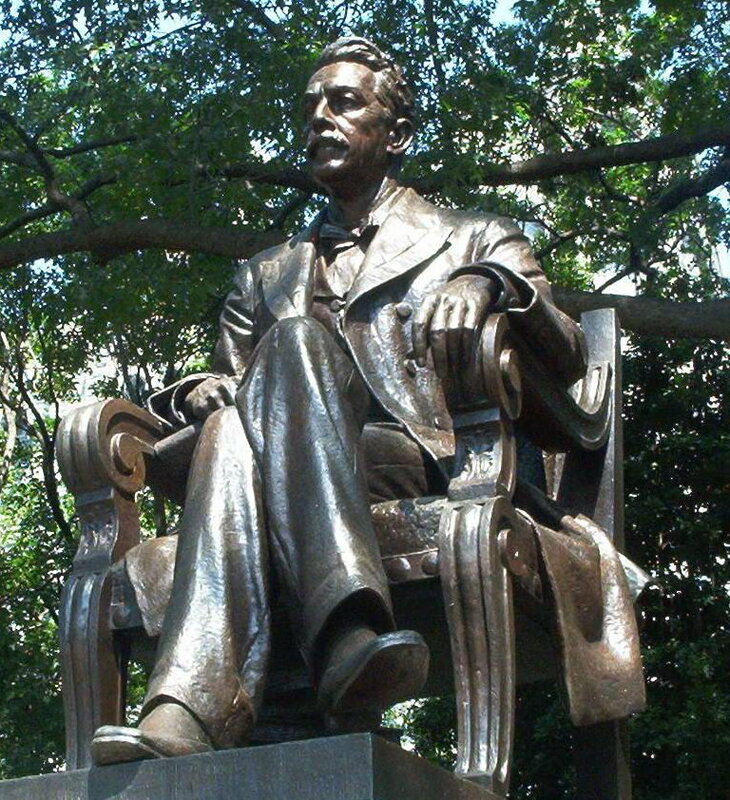 By Fred Moynihan Unveiled in 1907. It shows Stuart in a typically dashing pose. and the Lucky Strike tobacco factory. 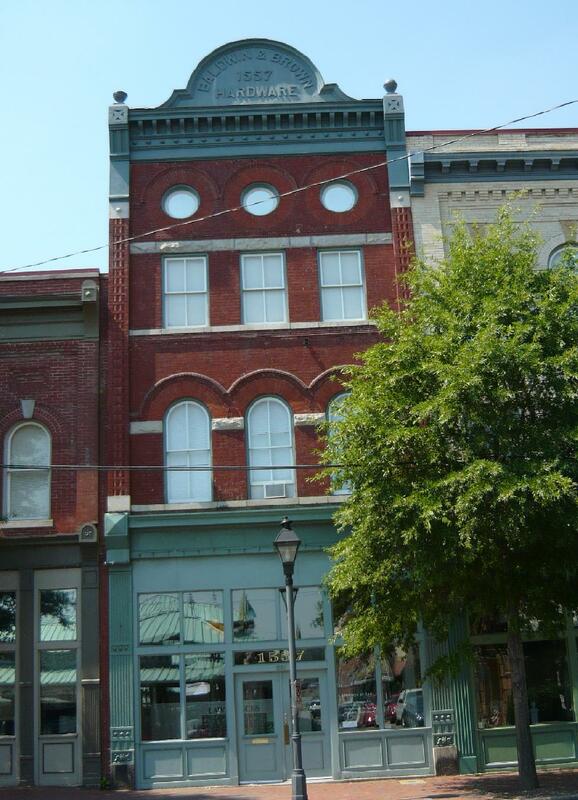 Many of these old buildings have been refurbished into condominiums and are very close to downtown. 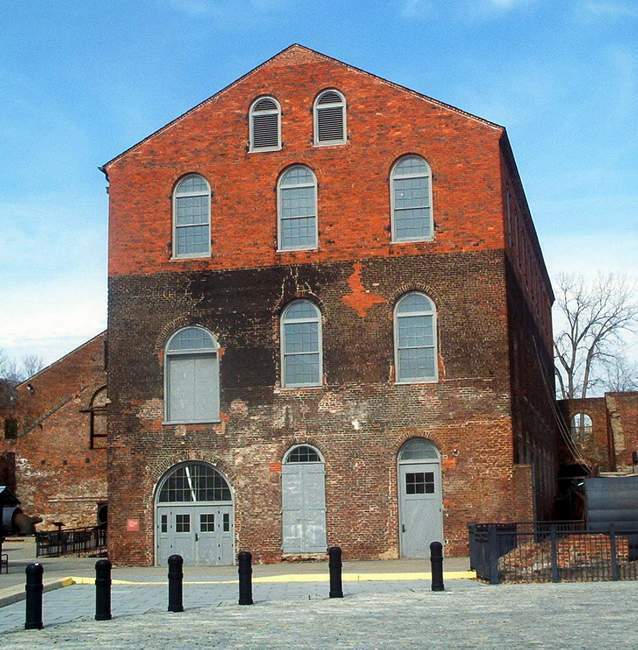 It served as the Confederacy's foremost iron manufacturer. 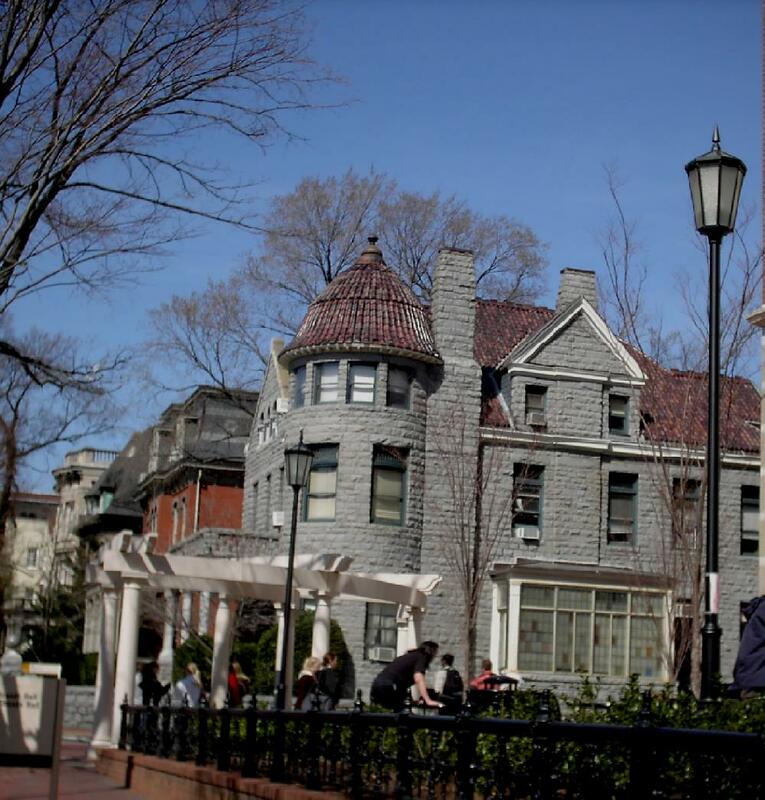 It is a National Historic Landmark and is now part of a museum complex. Photographed 15 Feb 2008 and Contributed by George Seitz. 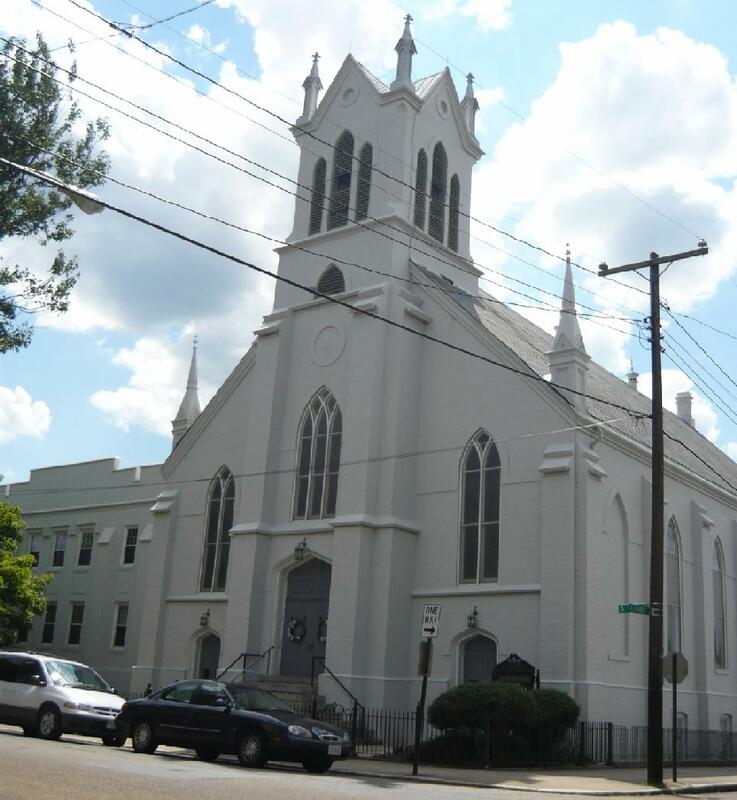 Erected in 1860, it was designed by noted Richmond architect Albert West, who was also a leading Methodist. 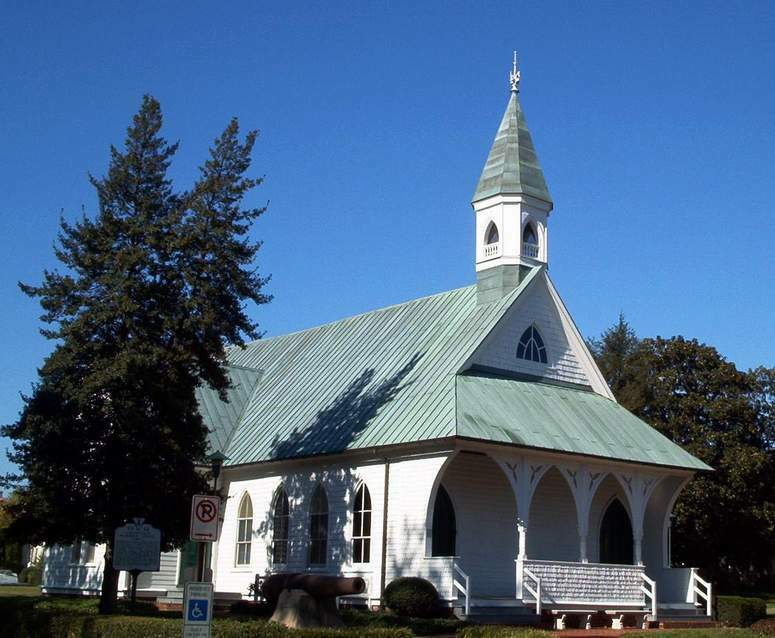 The congregation moved to Henrico County in 1945. Photographed 12 Nov 2007 and Contributed by George Seitz. 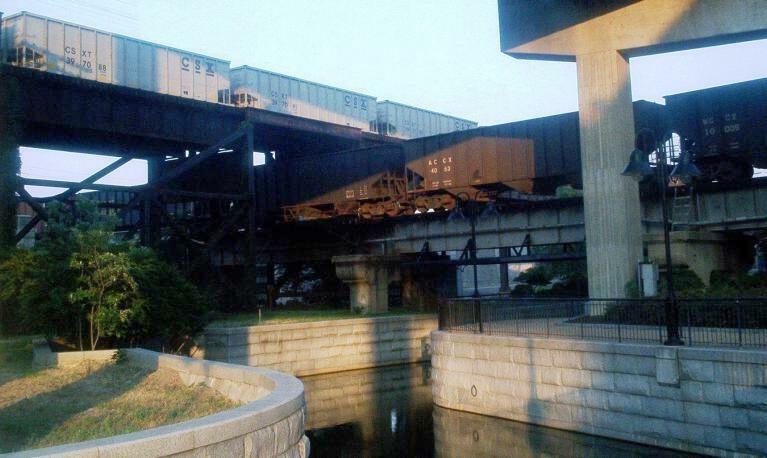 Soon after the Civil War, railroads were built over the old canal tow paths. By the canal is the only triple main-line railroad crossing in the world. The bottom line was built before the Civil War. In the early 20th century, the other two were added, contributing to Richmond's development as an important transportation hub. Photographed 25 Jun 2008 and Contributed by George Seitz. 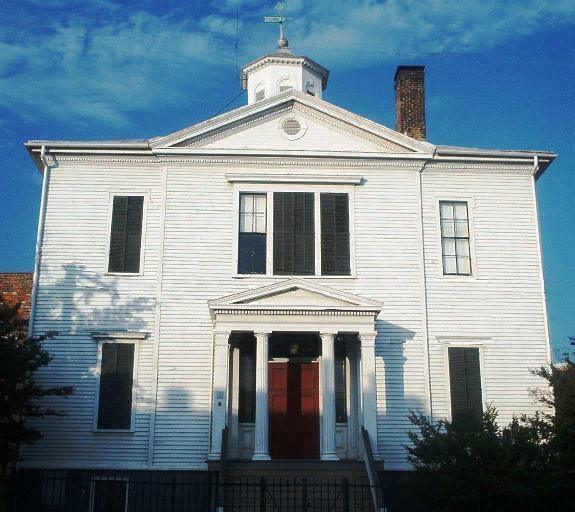 Built about 1798, it is believed to be the oldest remaining structure in the Jackson Ward neighborhood. The cottage is named after the original owner, Joel Tucker. It serves as an example of how commoners lived in the early 19th century. 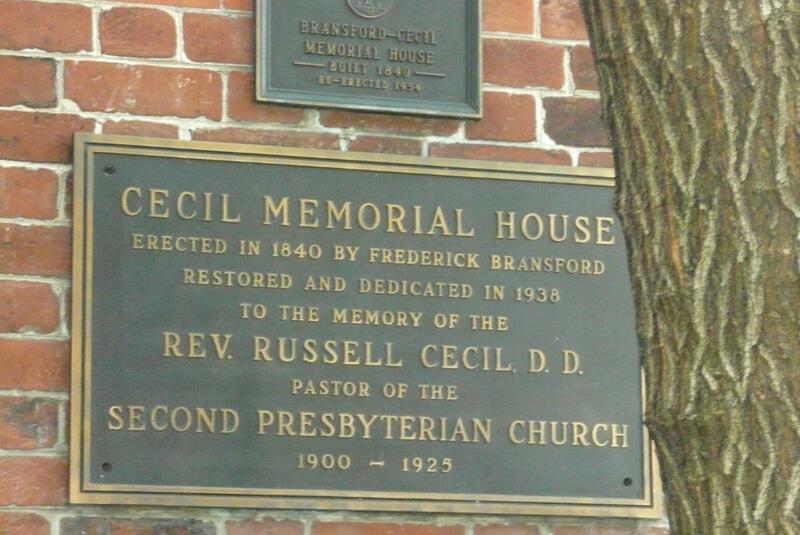 In late 2000, the city of Richmond moved the cottage from its original spot next to Third Street Bethel Church, so the church could expand. The cottage had been used as an office and storage building for a nearby motel. 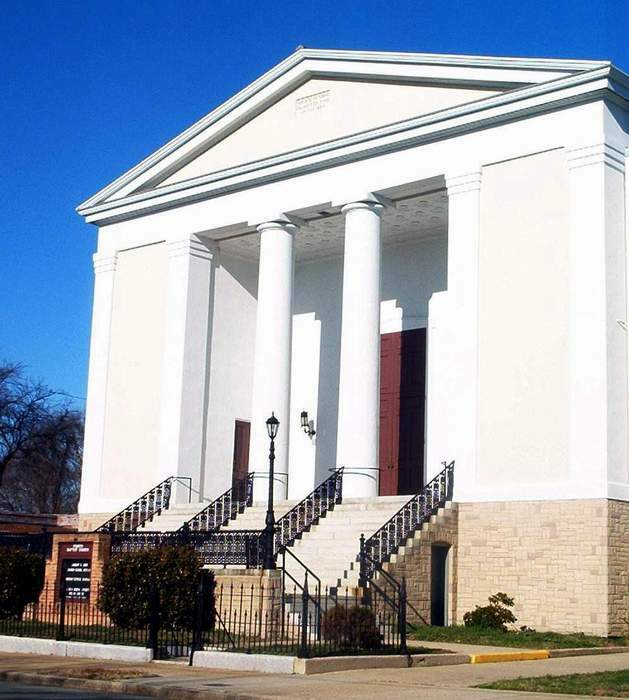 It sat under a tarp in the 700 block of North Second Street until it was moved in May 2004 to 701 Chamberlayne Parkway, where a service station was cleared to make way for the house. Photographed 21 June 2008 and Contributed by George Seitz. 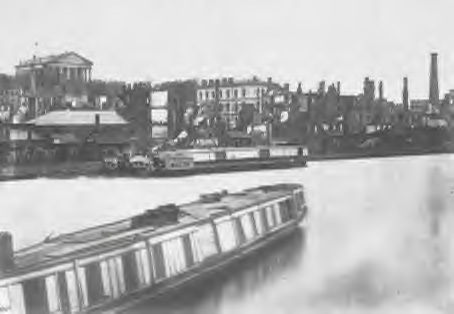 A packet boat in the turning basin in April 1864 - (see burnt buildings in background). In Capitol Square. By Thomas Crawford. Unveiled in 1858. Jefferson Davis was inaugurated in front of the statue. It's likeness appears on the Great Seal of the Confederacy. Built in 1812, by Alexander Parris. John Wickham was an illustrious lawyer. In 1882, the house was acquired by Mann S. Valentine II who lived in it until his death ten years later. He left the house with an endowment to serve as a museum for his various collections. The house appears to have entailed a modicum of Richardsonian Romanesque detail. 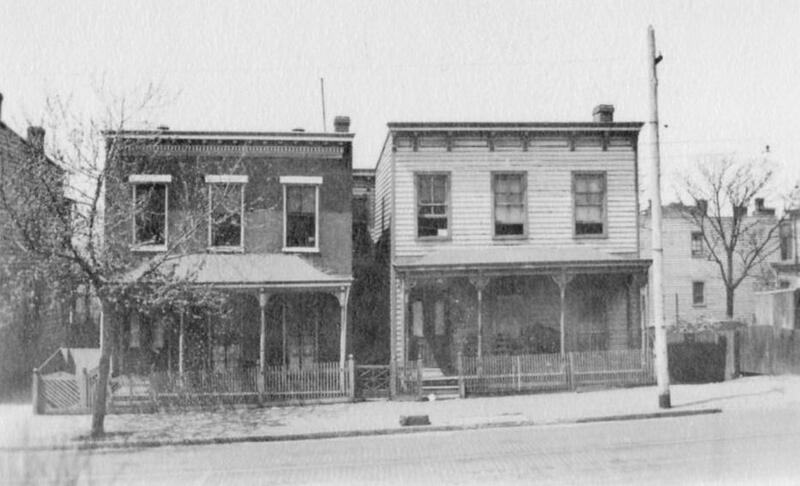 Younger started his wholesale grocery career in the partnership Heitman & Younger, 13 South 14th Street. By the 1890s, a new firm, L.C. Younger & Co., was a subsidiary of the many Millhiser business enterprises. 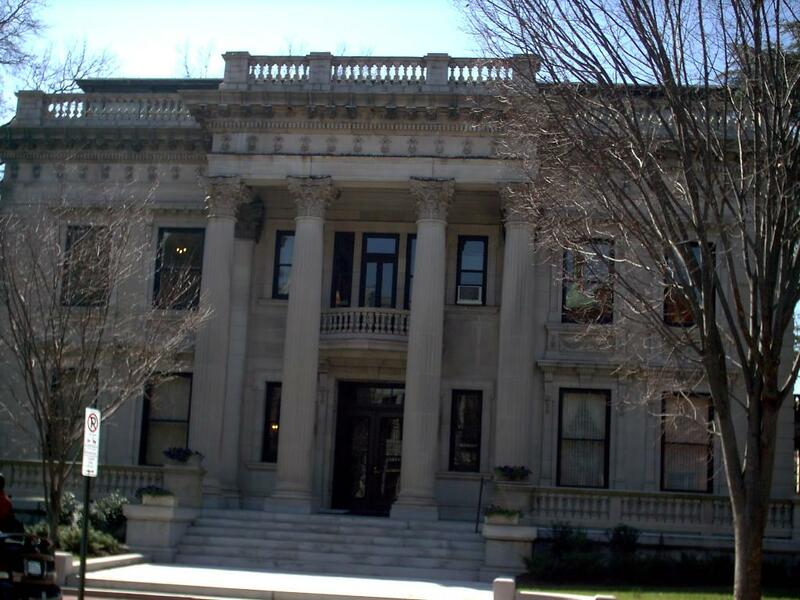 S.D Crenshaw, chemical mogul, hired Noland and Baskervill to update the house in 1904. The copper Greek Doric cornice and cresting was added by Noland and Baskervill. A Greek Doric limestone portico was also added at this time. A rear smoking room, added by Noland and Baskervill in 1904, consists of walls of clear leaded glass.